Looking for 80s recipes? I’ve compiled some of my favorites. What do you remember? I have a lot of fond 80s food related childhood memories. We didn’t eat out very often. I had the occasional McDonalds when my grandparents took me out as a treat. The first time I was inside a Taco Bell, I was 14 or 15 years old and only because I happened to go with a friend. Sometimes, my family would go out to Pizza Hut, but that was mostly from my Pizza Hut Book It rewards from school. We ate out so rarely that I can still distinctly remember my father taking me to Arthur Treacher’s for Fish n Chips when I was around 8 years old. It’s the only time I ever went there. My mom used a Crockpot slow cooker (doubled as a grill) at least once a week for classic meals like beef stew, chili, chicken and pot roast. We ate a lot of big family meals and always ate together at the dinner table. My dad was an avid hunter and fisherman, so there were those meals, too. sigh. My mom was a great cook, but sometimes she used some convenience foods on busy nights or if she was sick. She bought frozen dinners, so I could make myself food sometimes, too. 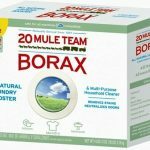 This changed by the mid-eighties as she went back to cooking healthier meals and processed foods were nearly banned from our home. 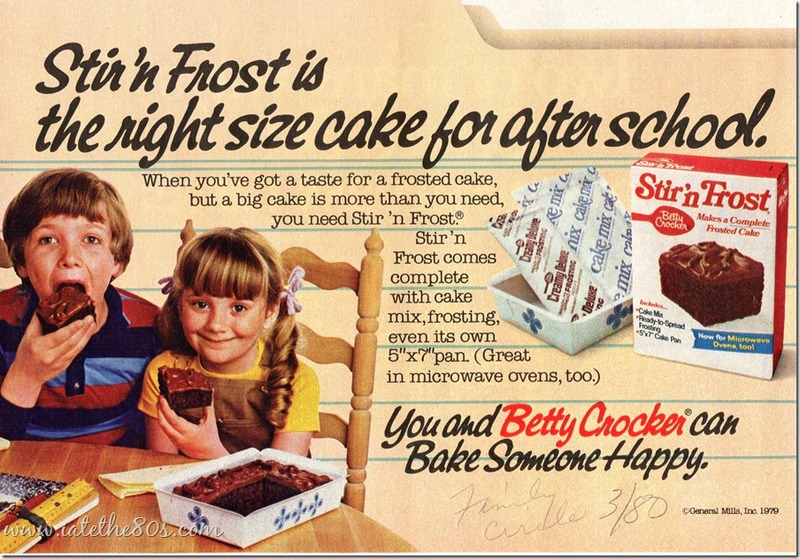 Looking back, there were some 80s food recipes that were popular with most families. Many are still popular now. 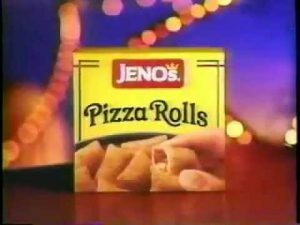 Here’s a few food brands I remember (most are still around) and recipes that I remember, too. Some I will share an older classic recipe and a more modern version. I hope this helps anyone looking for 80’s theme party recipes, too. I make these occasionally and to get my kids to eat them, I call them Crabby Patties. 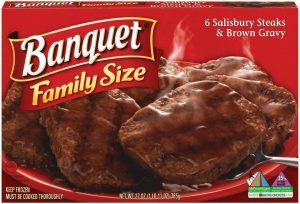 My mom made them when I was a kid using a McCormick season packet or a can of Manwich sauce for convenience and I was happy to have them for dinner and would often request them after Lent because I was desperate for meat. Lent was incredibly difficult for me. Let’s just say that I still can’t eat fish or seafood. Brown the ground beef in a large pan and set aside. Heat the oil in the pan. mustard, brown sugar, gochujang, beans, salt and pepper and simmer for a few minutes. 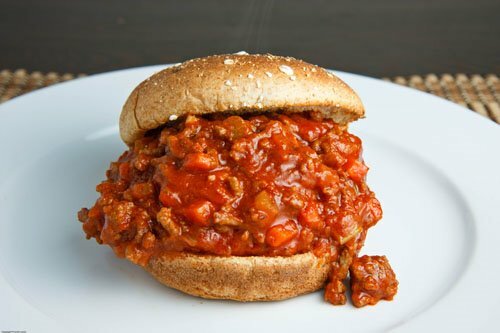 –Traditional Sloppy Joe’s recipe and photo by Closet Cooking. 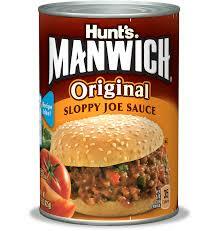 1/3 recipe of your favorite Sloppy Joe’s. Here is mine. 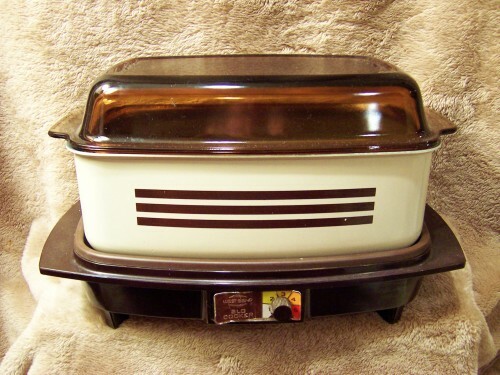 Start by preheating the oven on broil. In a single layer, place the potato chips on a baking sheet. 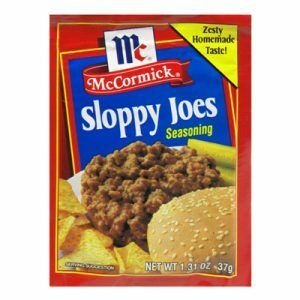 Spoon a generous amount of hot Sloppy Joe’s on each chip. 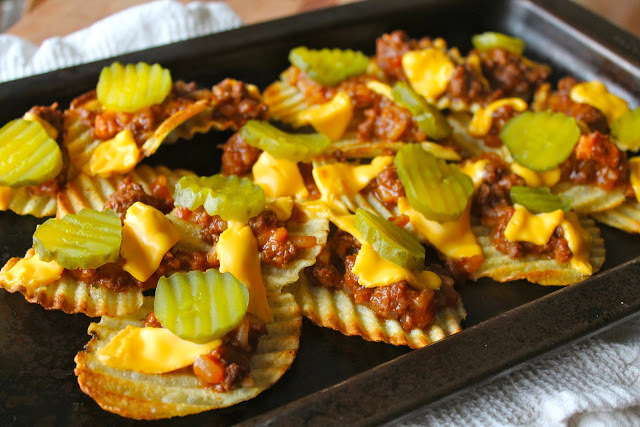 Top with cheese and a pickle on each chip. Preheat the oven to 350 degrees F (175 degrees C). Cut the biscuit dough into quarters and press to cover the bottom of a 9×13 inch baking dish. I loved this and looked forward to it when our whole family would have get-togethers. Some people made chipped beef, others made it with a sour cream recipe or spinach or artichoke. 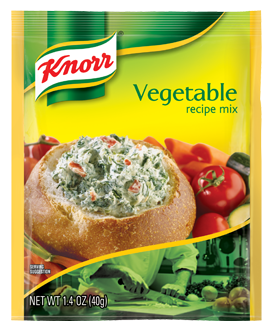 Our family used Knorr Vegetable Mix to make dip and we usually used Pumpernickel or Rye bread. But we would always have other breads and various crackers served with it. 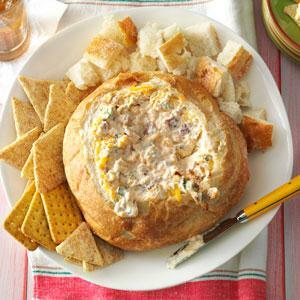 Now tons of foods such as soup, stew, chili, eggs and various pasta dishes are served in bread bowls. And there are a lot of new ideas to use various foods other than bread as the “bowl”. For example, peppers, egg plant, pumpkins (and various squashes), tomatoes, mushrooms, potatoes, cucumber, biscuits, etc. And that’s not including dessert bowls. haha But hey, how about taking the Sloppy Joe recipe from above and putting it into a bread bowl and topping with melted cheese? Preheat oven to 350 degrees. If using bread slice top off of bread and hollow out. Reserve removed bread or you can just use bread for dipping and bake in a glass dish. Beat cream cheese & sour cream on med for 2 minutes. Stir in all remaining ingredients and mix well. Cut the top fourth off the loaf of bread; carefully hollow out the bottom, leaving a 1-in. shell. Cut the removed bread and top of loaf into cubes; set aside. Worcestershire sauce until blended; stir in bacon and onions. Spoon into bread shell. Wrap in a piece of heavy-duty foil (about 24 in. x 17 in.). Bake at 325° for 1 hour or until heated through. I’ll admit, I still make this. I mix things up by using different pasta such as bow ties, mini shells, or tortellini. Sometimes I’ll turn it into an Antipasto, Caesar or Bacon Ranch salad, too. 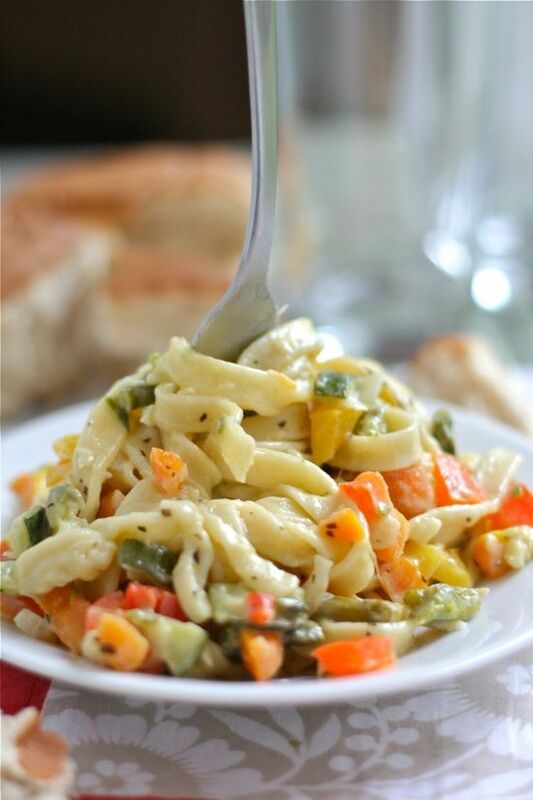 When making the recipe below, you can add cheese, broccoli and carrots, etc. 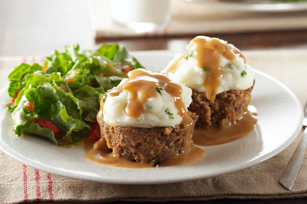 Mix meat, stuffing mix and water; press into 8 muffin cups sprayed with cooking spray. Add cream cheese and garlic to potatoes; stir until cream cheese is melted. Stir in parsley. Scoop over meatloaves. Serve with gravy. 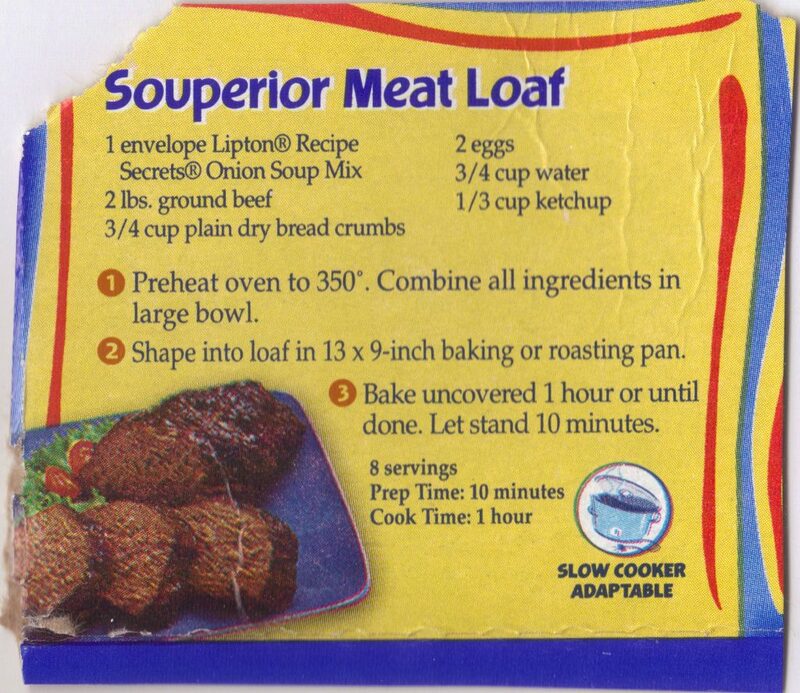 –Meatloaf Recipe and Photo by Kraft. Here are some Lipton Recipe Secrets Recipes. 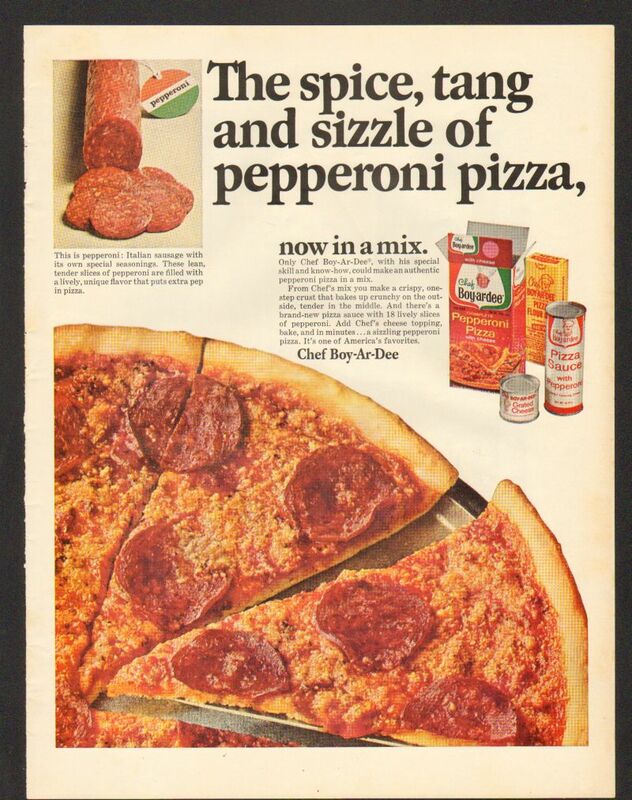 Sadly this specific kit has been discontinued, but there are still many products available to make pizza at home even if you don’t make the dough from complete scratch. You can buy boxed mixes, frozen dough, pizza shells, etc. I’ve decided to share a pizza dough recipe for this one since convenience options don’t require much instruction. Remove dough from bowl and place in a large well-greased bowl (I prefer using olive oil, but you can also use Pam). Cover bowl tightly with plastic wrap and allow to rise for 2 hours. You can also do a “quick-rise” method and stick the bowl in an oven that has been heated to 200 degrees and then TURNED OFF (that way it’s nice and warm in there, but please make sure your oven is actually off before sticking the dough inside). Let it rise for 1 hour. Preheat oven to 450 degrees. Brush the olive oil over the entire top of the pizza dough. 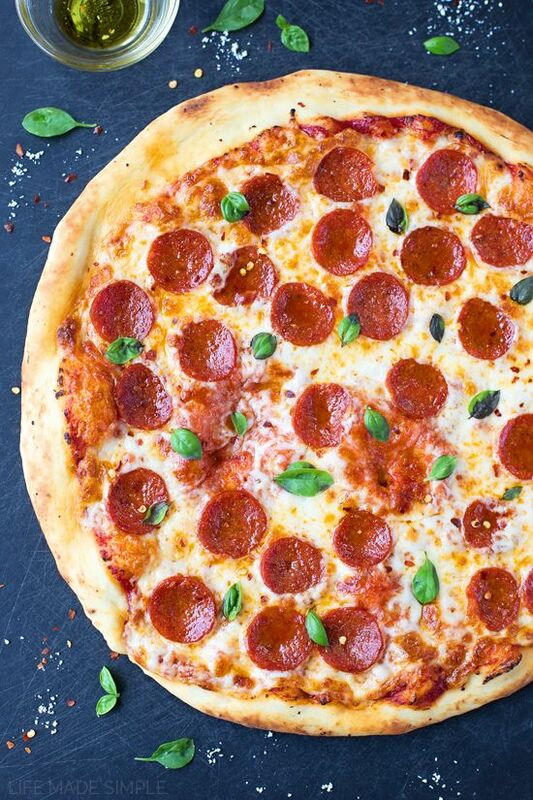 Spread an even layer of pizza sauce over the pizza, leaving about ¾”-1″ of dough around edges for the crust. Top with the grated parmesan cheese, then the mozzarella. 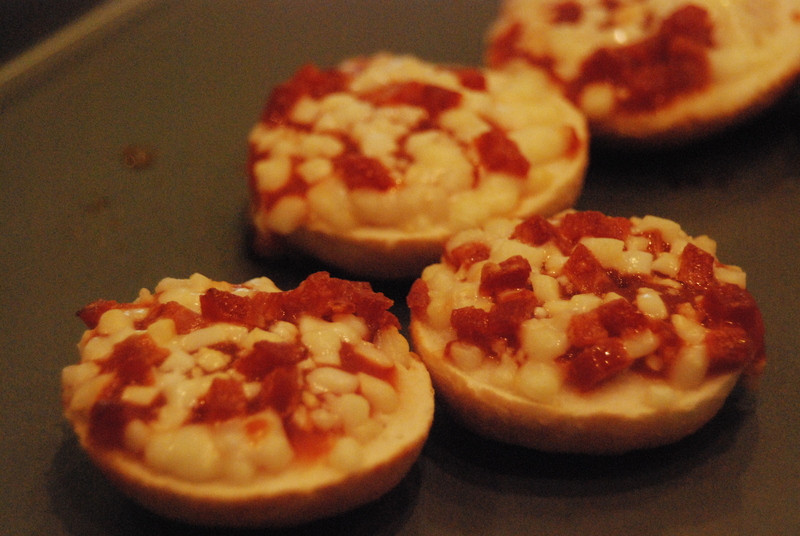 Place the pepperoni slices on then bake for 12-15 minutes or until the crust is golden brown. Remove from the oven, sprinkle with the red pepper flakes, allow to cool for 10 minutes before topping with basil or oregano (to prevent discoloration and wilting). Slice and serve immediately. Anyone else like me that hated when the frozen pot pie only had a crust on the top and not the bottom? In a large skillet melt butter over medium heat. Add onion, celery, and carrot and cook 4 to 5 minutes. Sprinkle flour on top of onion mixture. Cook and stir for 1 minute. Gradually whisk in chicken broth and half-and-half. bubbling and thickened, about 1 to 2 minutes. Stir in chicken and peas. Remove from heat. Repeat with remaining dough circles. Place on prepared baking sheet and brush tops with egg wash.
Maybe you remember Banquet’s. Or maybe you were lucky and your family had a homemade recipe. This dip was everywhere. 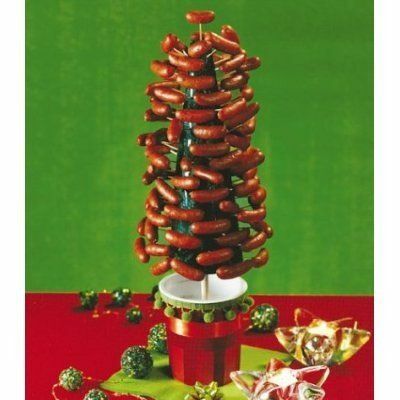 It was so popular that often times, there would be more than one at a potluck or party. It’s still a crowd pleaser. 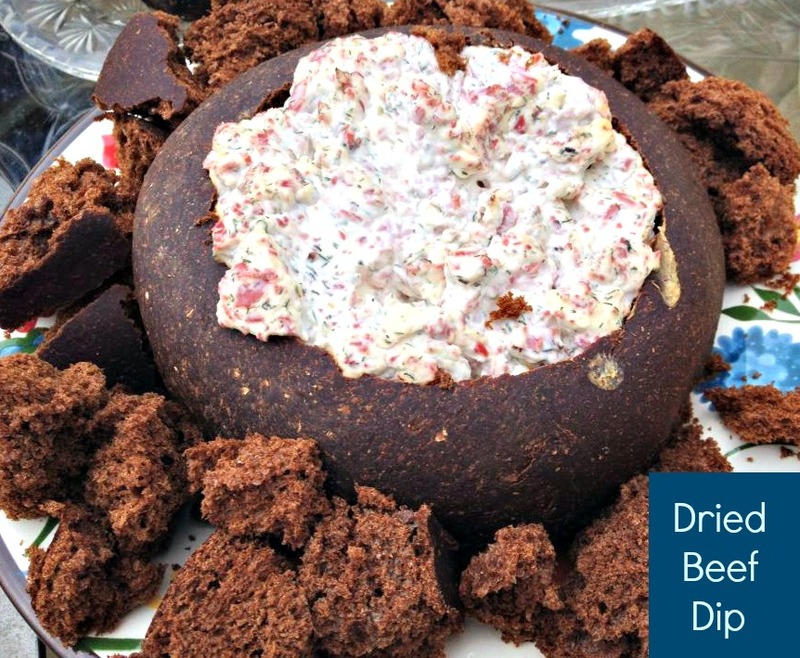 Not much has changed through the years with this classic dip other than offering individual servings. by a layer of the sour cream mixture, then the cheese, tomatoes, olives, red onion, and green onions. Then sprinkle the cilantro evenly on top of the green onions. Can put the dip in individual cups, jars, glasses, etc., too. Oh man, the blue cheese and celery sticks. Mix together the flour, salt, cayenne pepper and paprika. 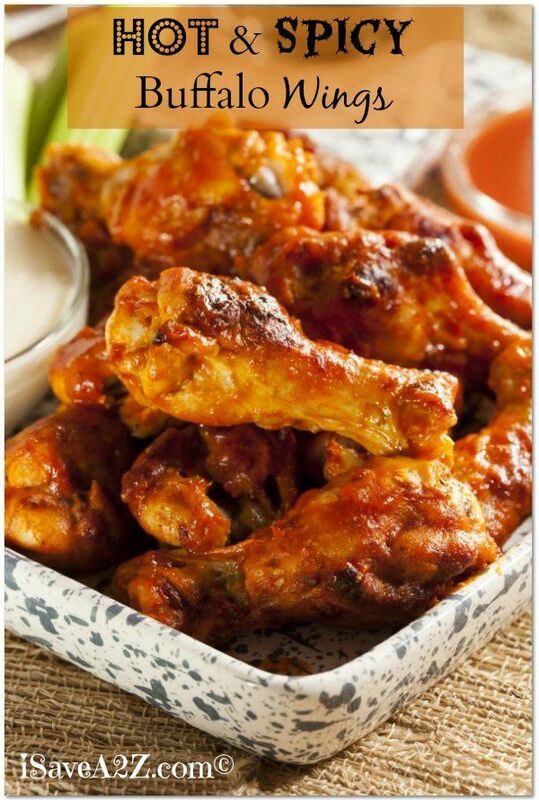 Put the chicken wings in a large bowl, pour flour mixture on wings and toss until they are evenly coated. Cover the bowl and refrigerate for 1½ to 2 hours. When you are ready to cook wings, line a cookie sheet with aluminum foil and spray it generously with non-stick cooking spray. Spread wings out on cookie sheet and bake at 400 for 20 minutes. 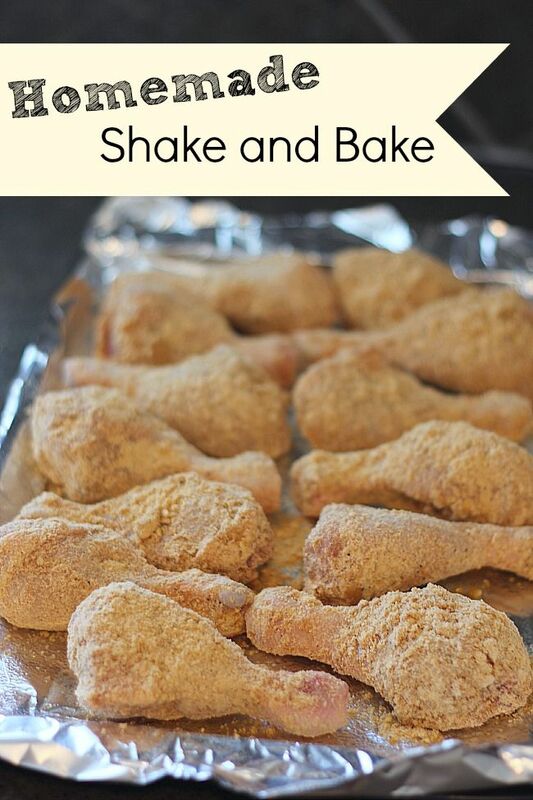 Turn wings over and bake for another 20 minutes. Then broil wings for 1 minute on each side. Put butter, garlic powder, pepper and hot sauce in a bowl and microwave until butter is melted. Then stir until it is well blended. I liked Rice-a-roni. My mom rarely made it (always homemade white rice daily), but my grandma did sometimes. I have made it, but don’t buy it often because much like my mom, I make my own rice using a rice cooker. Here are some Rice-a-roni recipes. 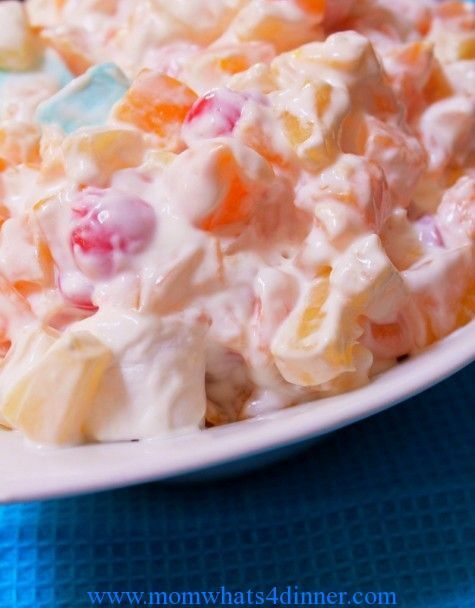 I like Ambrosia salad. I used to just call it fluff or fruit salad. 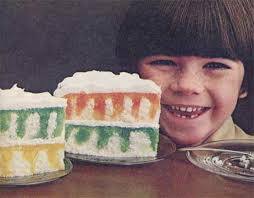 I still sometimes make a version of this with canned mandarin oranges and pineapple with orange jello and Cool Whip. It tastes like a Creamsicle. Some recipes have grapes or nuts, others don’t. Some use yogurt, others use sour cream or even pudding. Waldorf Salad was popular, too. Add apple to a large bowl and toss in lemon juice to keep from browning. 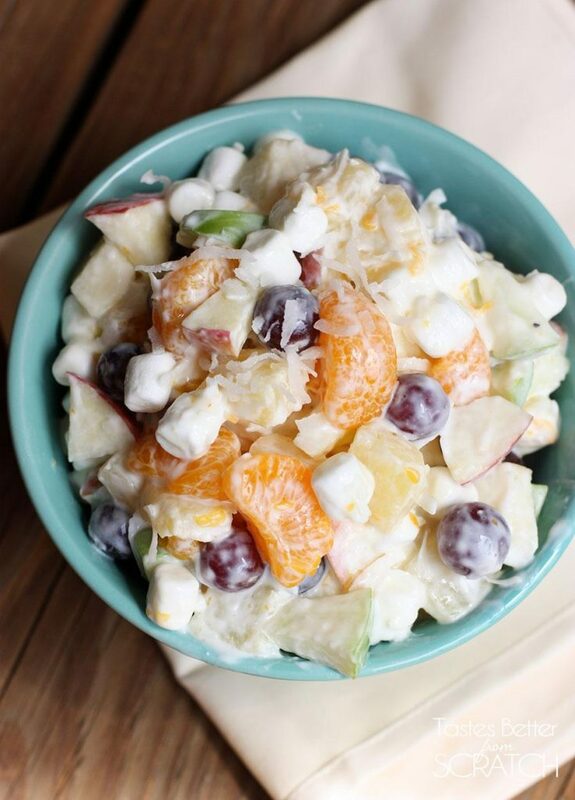 Add the pineapple, mandarin oranges, grapes, coconut, and marshmallows and toss to combine. Stir in Greek yogurt, gently tossing to coat. Refrigerate for at least 4 hours prior to serving to allow the flavors to meld together. Serve chilled. 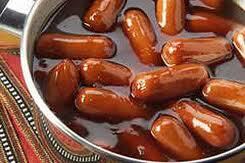 Sometimes lil smokies were used instead. 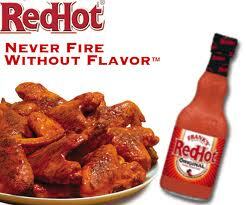 Sometimes they were in BBQ sauce other times in a grape jelly and chili sauce. But always with fancy toothpicks. Here’s 13 cocktail weiner recipes. 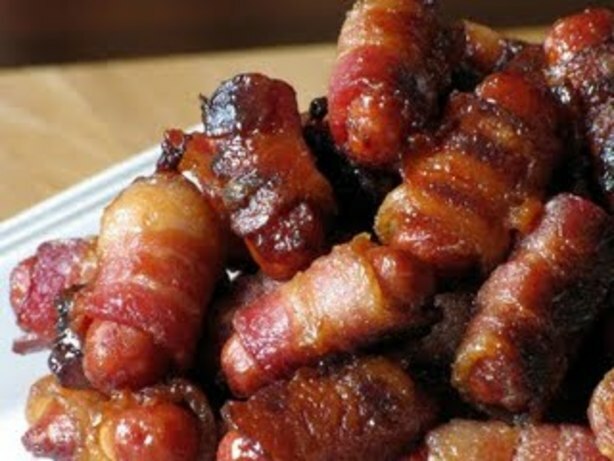 Or try bacon wrapped cocktail wieners. 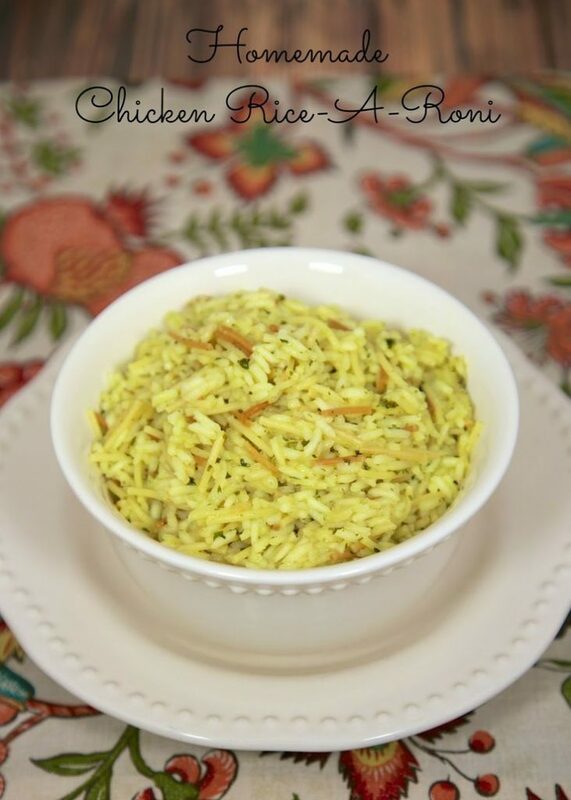 I love these served as an appetizer or served over egg noodles or mashed potatoes. The first version doesn’t have sour cream which is a bit weird to me. So I’m including one that does have sour cream, too. 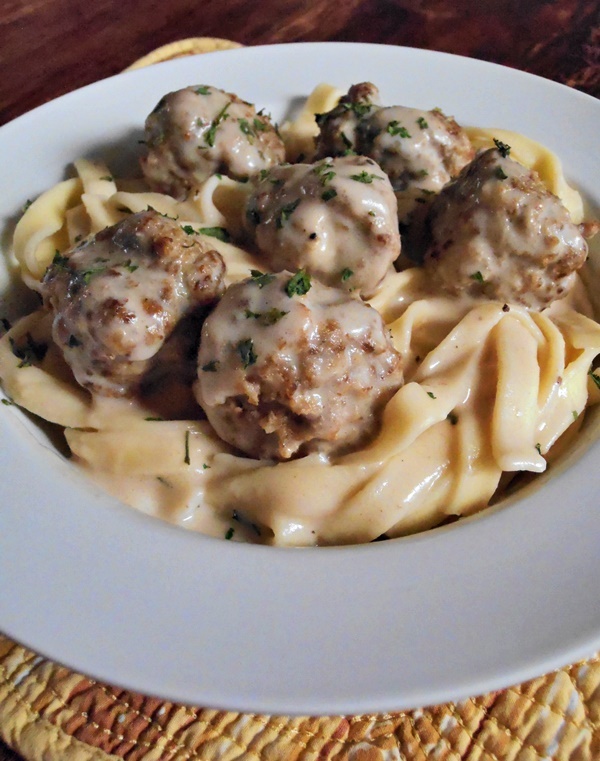 You can make meatballs and put them in the same sauce as the cocktail weiners recipe I shared, too. Or make porcupine meatballs. To make the meatballs: Heat the butter, in a skillet, over medium heat. Saute the onion, garlic, allspice, salt, and white pepper, for about 5 minutes, or until garlic and onions are soft. (Using dried minced onions will take less take to cook) Add the milk and Worcestershire sauce to the mixture, and bring to a simmer. until combined. Spray a sheet pan to grease, and roll the meat into 1 inch balls, and place on a baking sheet. Heat the oven to 400 degrees and bake the meatballs for about 20 minutes, or until cooked through. To make the gravy: Melt the butter in a skillet and add the flour. Cook for a few minutes while whisking. Pour in the beef broth and Worcestershire sauce, bring to a simmer. Finally, add the heavy cream and the cooked meatballs. Let simmer, until the gravy thickens, about 10 minutes Season with salt and pepper, to taste. Place the pieces of bread in a large bowl and mix with the milk. Let sit for 15 to 20 minutes for the bread to absorb all of the milk. Once the bread has soaked up the milk put the bread in a food processor and pulse until it has been completely broken up. Return the pulverized milk soaked bread to the bowl. Heat 6 Tbsp of butter in a large sauté pan on medium heat. When the butter is melted and foamy, start adding some meatballs to the pan. Working in batches as to not crowd the pan, slowly brown the meatballs on all sides. 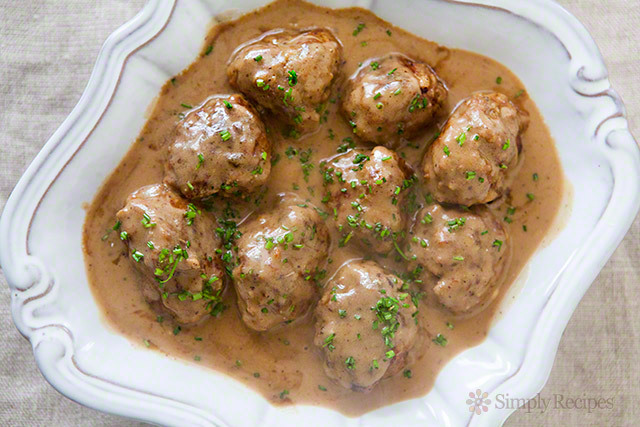 Handle the meatballs gently so they do not break apart as you turn them. at this point, you only need to brown them. 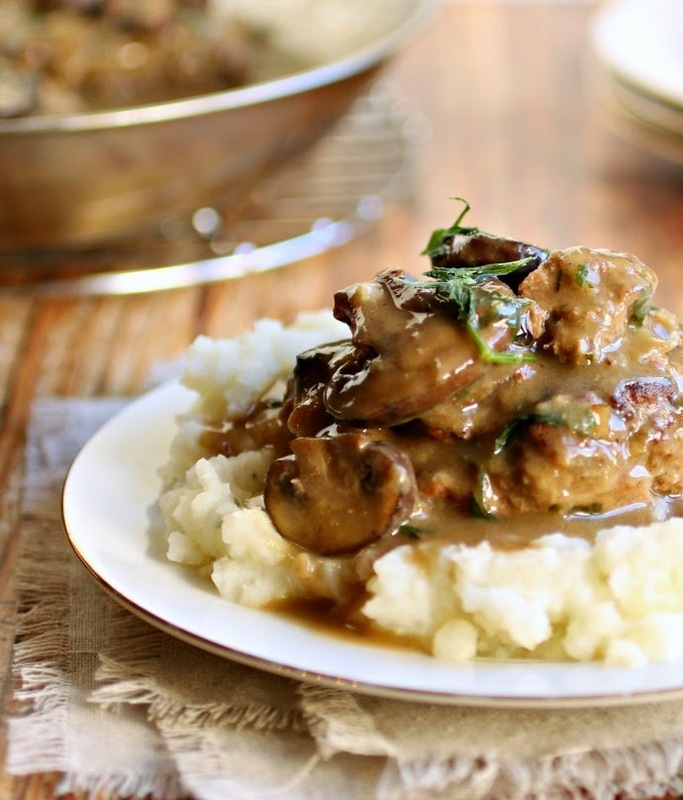 You’ll finish cooking the meatballs in the sauce later. Once you have removed the meatballs from the pan, keep the remaining butter in the pan. You’ll use this butter to make the sauce. If the butter in the pan has become burnt through the browning of the meatballs, remove and discard it, and add 6 Tbsp of fresh butter to the pan. Otherwise use the existing pan butter, you should have 6 Tbsp total of butter in the pan. If not add more. allowing the flour mixture to cook, several minutes, until the roux is the color of coffee-with-cream. at first and the roux may seize up, but keep adding the stock slowly and keep stirring. Eventually the sauce will loosen and become silky. Return the meatballs to the pan with the sauce and lower the heat to low. Cover the pot and cook on low heat for 10 minutes. You may need to work in batches. Deviled eggs are one of those foods that I’m extremely cautious over trying anywhere outside of my family. It’s frightening what some people can do to an egg. While I’m open to variations on deviled eggs (such as adding bacon), I prefer mine simple because that’s how my family always made them. 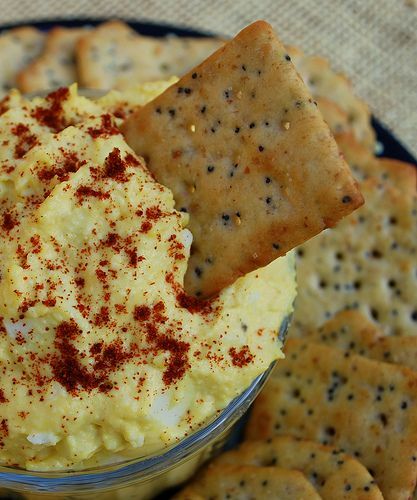 I make my deviled eggs about the same way that I make my egg salad with the exception of sprinkling Paprika on top. I’ll pipe the yolk mixture if I have time, but it doesn’t bother me to have it just spooned into the egg halves. Hard boil, cool, and peel eggs. Cut eggs in half lengthwise and carefully remove the yolks. Place yolks in a bowl. Mash with a fork. Add mayonnaise, yellow mustard, vinegar, salt and pepper. Continue mixing and mashing with a fork until smooth and creamy. the mayo and mustard. Process until smooth. Scrape the mixture into a bowl and blend with the chopped egg whites. Season with salt and pepper. 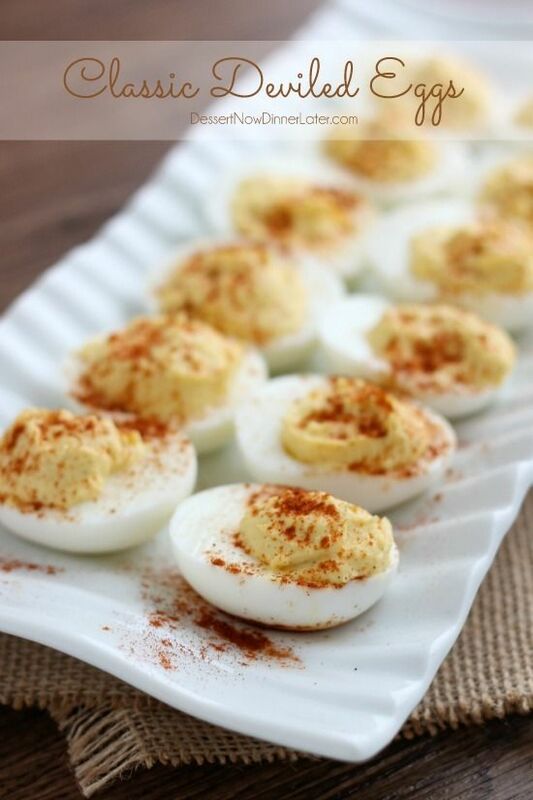 Here’s 50 deviled egg recipes. 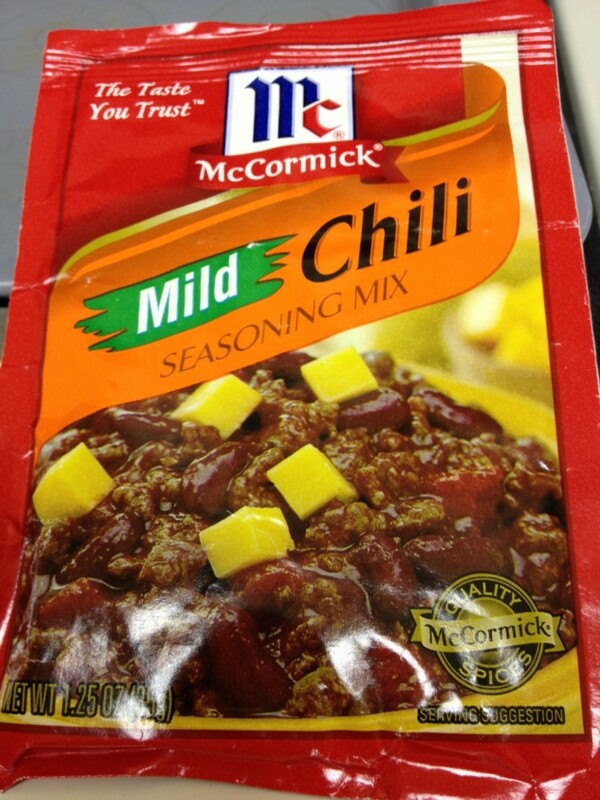 For a quick fix, I would sometimes request Hormel canned chili or Mccormick’s powder mix packet chili. My mom’s chili was awesome. We had chili dogs, chili fries, baked potato with chili, chili over pasta (chili mac), chili on nachos or with corn chips. Our family loved chili. haha. No con carne. Oh please no. I like my chili pretty plain. I like my chili with ground beef, onion, kidney and pinto beans, tomato sauce and diced and onion. Then bring on the sour cream and cheese. Love it with crusty bread, but I’ll take saltine crackers. But there are all kinds of chili recipes. Some have quinoa, pumpkin, or beer, etc. Clearly not everyone is as dull as I am about chili. sour cream, cheese, green onions etc for serving. In a heavy bottomed pot, add the oil and heat over medium heat. add the onion and saute until tender, about 5-7 min. add the garlic, stirring everything together to not burn the garlic, and cook until fragrant, about 1 minute. add the minced bell peppers and saute for another 2-4 minutes or until the peppers are tender. Add the ground turkey to the pot and cook through until almost cooked through, about 5-6 minutes. dump all of the spices over the meat and quickly stir it all in. let the spices cook onto the meat for 1-2 minutes. add the dr pepper, tomato paste, and knorr stocksee note. stir until the tub of stock and paste have dissolved. add the pinto beans, and tomatoes and turn the heat down to a simmer. simmer for 30-all day. the longer it simmers the better the flavor. mine simmered for 2 hours on a very low heat. Serve with cool sour cream, grated cheese, green onions, and chips. In a medium bowl, combine all ingredients and mix well. 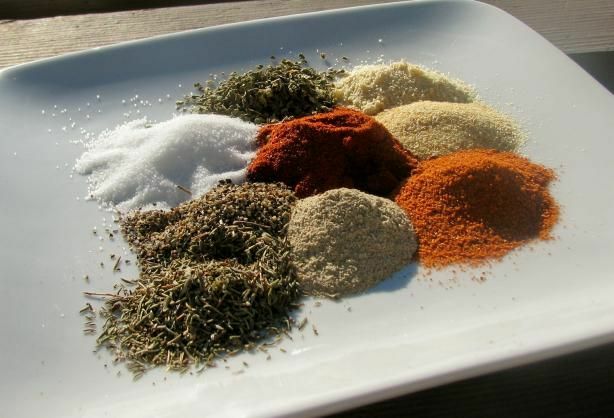 Store the seasoning mix in an air-tight container for up to one year. 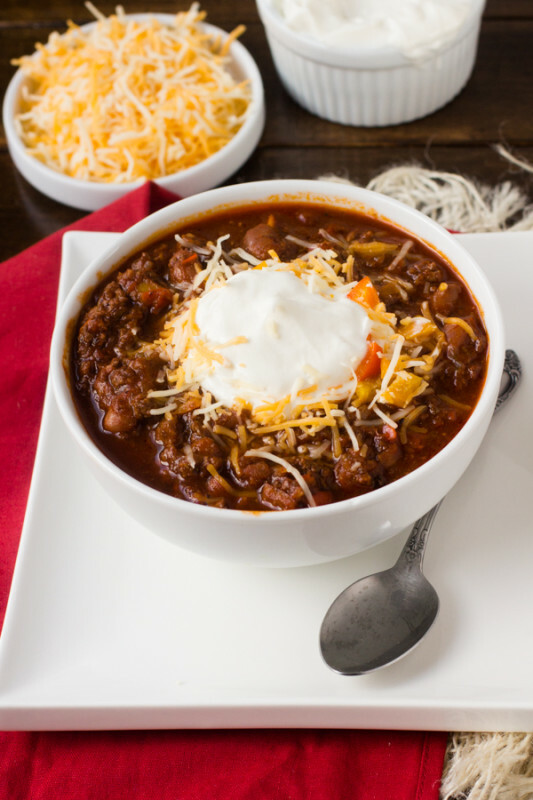 For use in chili, use about 2 1/2 tablespoons of the above mixture in a recipe that calls for one packet of chili seasoning; adjust to your taste. Here’s some McCormick Recipes and a classic crockpot chili recipe. 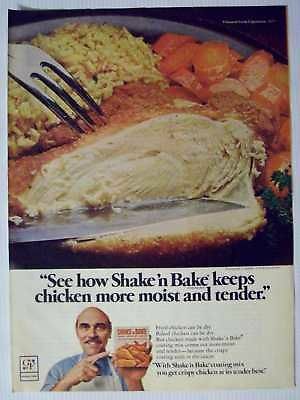 I loved chicken fried steak. I would get cravings and ask my mom to buy me the Banquet’s version. Oh my. It was quick and easy, but the absolute worse to look at. 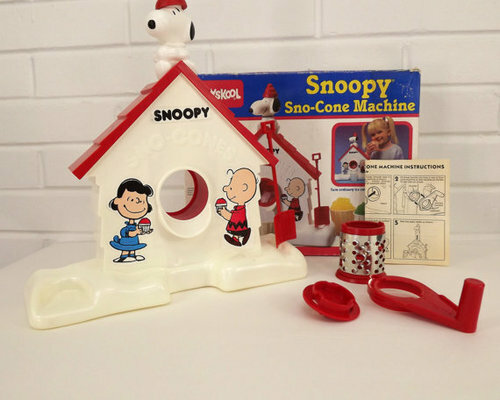 But as a kid, I was just happy to make something myself. 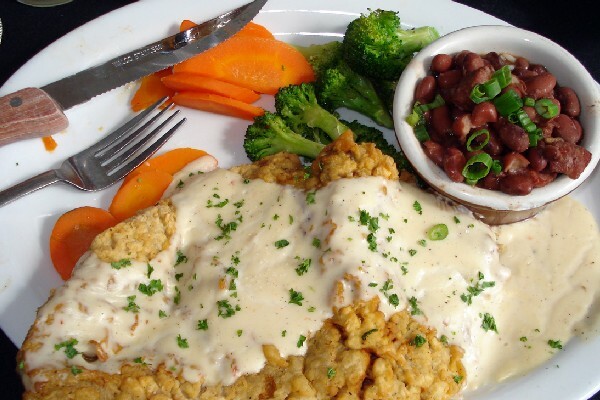 Thankfully there are plenty of chicken fried steak recipes. Pound the steaks to about 1/4 inch thickness. Place 2 cups flour in a shallow bowl. Stir together baking powder, baking soda, 1 teaspoon pepper, and 3/4 teaspoon salt in a separate shallow bowl; stir in buttermilk, egg, hot pepper sauce, and garlic. Dredge each steak first in flour, then in batter, and again in flour. Pat flour onto the surface of each steak so they are completely coated with dry flour. Heat shortening in a deep cast-iron skillet to 325 degrees F (165 degrees C). Fry the steaks until evenly golden brown, 3 to 5 minutes per side. Place fried steaks on a plate lined with paper towels to drain. Drain the fat from the skillet, reserving 1/4 cup of the liquid and as much of the solid remnants as possible. I remember everything chicken , shrimp and fish was blackened. It’s kind of funny. As a kid, it looked burnt and with all the cajun spices, I was begging for PLAIN chicken. People were even blackening their turkeys. I was in fear for the holidays! Would it be a Cajun holiday? Mix together the paprika, salt, cayenne, cumin, thyme, white pepper, and onion powder. 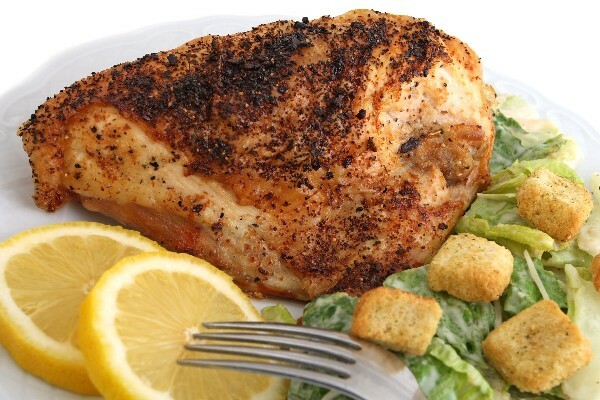 Oil the chicken breasts with cooking spray on both sides, then coat the chicken breasts evenly with the spice mixture. Try Blackened Chicken Club Sandwich. I love potato skins. But I have to admit I prefer making baked potatoes with fixin’s because it’s faster. Potato skins take work. But they are definitely worth the time if you have it. 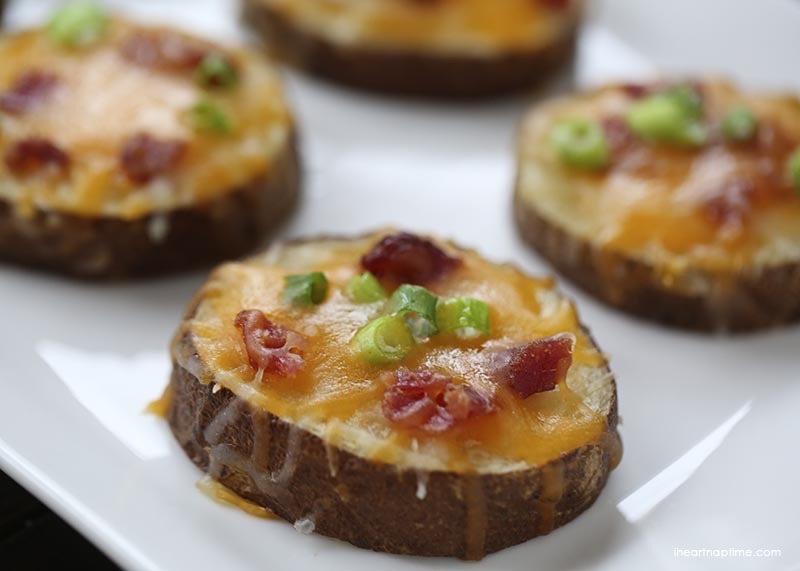 I can’t apologize for all of the following potato skin recipes. 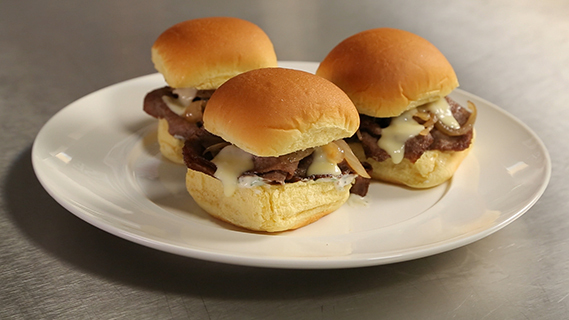 it’s a must-have party food item and ya gotta have options. How about Sweet Potato Skins? Preheat the oven to 450 degrees F. Place the potatoes on a baking sheet and drizzle with 1 tablespoon of oil. Salt and pepper liberally and shake the pan a little to coat them with oil. Roast for 30 minutes, or until cooked through. Then set aside to cool. Meanwhile, cook the macaroni in a large pot of salted water, according to package instructions. Drain and set aside in a colander. Using the same pot, melt the butter over medium-high heat. Once melted whisk in the flour and cook the roux (butter-flour mixture) for 1 minute. Then whisk in the milk and add the sour cream and 8 oz cream cheese. Bring to a simmer and whisk until the mixture is thick and smooth. Add 1 lb shredded cheddar and whisk until smooth. Then add a dash or two of cayenne pepper and salt and pepper to taste. 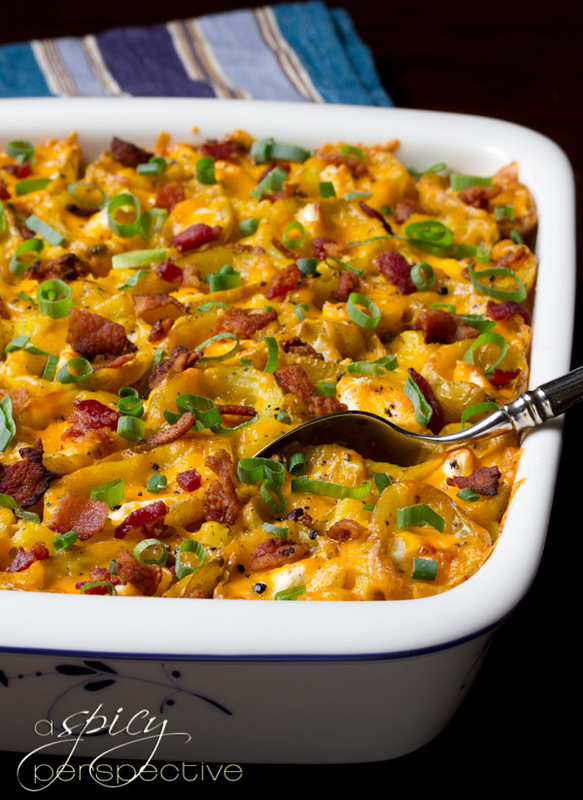 Pour the cooked macaroni, 2/3 cup crumbled bacon, and 2/3 cup green onions into the cheese sauce. Stir to coat. Pour the macaroni into a 9X13 inch baking dish and set aside. For the potato skins recipe: Preheat the oven to Broil. Cut each potato in half lengthwise. carefully scoop of most of the flesh, leaving just a little potato attached to the skin. Reserve the crumbled potato flesh. Brush the potato skins with oil. With the remaining 2 oz. 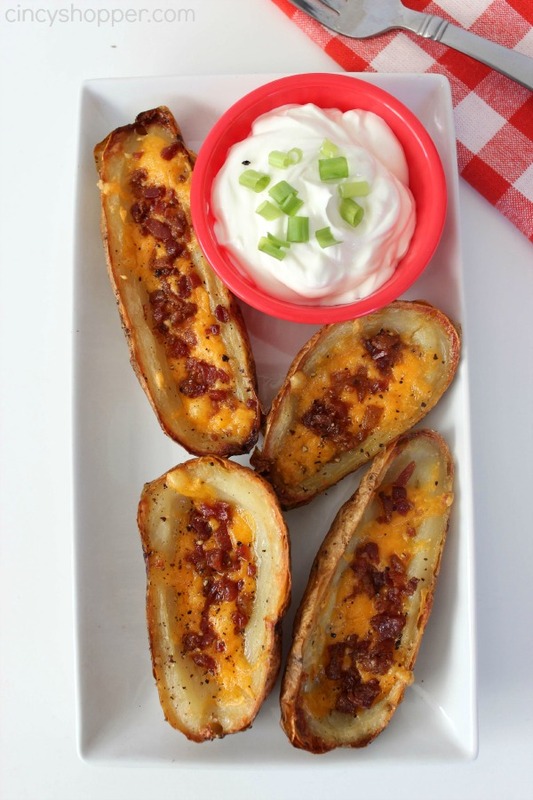 of cream cheese, place a scant 1/2 tsp dollop of cream cheese in each potato skin. Sprinkle the crumbled potato over the mac and cheese. Then arrange the potato skins over the top. Sprinkle the remaining 1/4 lb. shredded cheddar over the potato skins and add pepper to taste. For creamy baked mac and cheese, place the baked mac and cheese in the oven under the broiler for 2-3 minutes, watch carefully. You want the cheese to melt and the tops to toast, but not burn. For more a traditional “firm” baked mac and cheese recipe, turn the oven to 400 degrees, and bake for 20 minutes until the tops are golden. I LOVED steak-umms and begged begged begged for them. Combine mayonnaise, minced garlic, lemon juice, parsley and ¼ tsp. black pepper. Stir until all ingredients are uniformly mixed. Add 3 Tbsp. extra virgin olive oil to a large skillet on medium heat. Add Vidalia onions to skillet. Add ½ Tbsp. course sea salt and 1/4 Tbsp. black pepper. Cook for approximately 10 minutes until onions begin to look translucent and slightly caramelized. Turn heat to high, add ½ cup Marsala wine and cook for approximately 5 minutes until all of the wine has been absorbed by the onions and the onions are caramelized. Add the remaining ¼ cup Marsala wine to deglaze the skillet to finish. Add 2 Tbsp. extra virgin olive oil to a large skillet or griddle set on high heat. 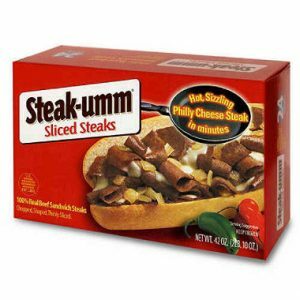 Once oil starts to slightly smoke, add Steak-umm® Sliced Steaks. Cook 2 to 3 minutes while utilizing a metal spatula to break up the steaks. Finish with Worcestershire sauce. Fill a medium-sized saucepan halfway with water and set to simmer. Once simmering, place a smaller saucepan inside the simmering medium saucepan. Add the Havarti cheese and carefully stir until completely melted and smooth in consistency. I still buy bags of frozen pizza rolls for my kids sometimes. 10 minutes, and when it’s done, you should have about 1 cup. 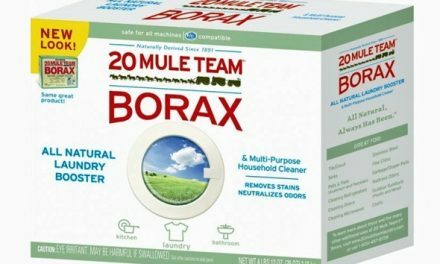 Transfer to a heatproof bowl and refrigerate for at least 30 minutes, or up to 2 days. Meanwhile, line rimmed baking sheet with parchment paper. Using a fine mesh sieve, dust about half of the cornstarch onto the parchment. 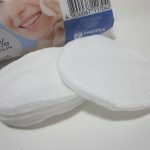 at a time, lay them on your work surface. Add 1 teaspoon of filling to the center of each wrapper. Dip your finger in the water, and moisten the edges of one of the wrappers. Fold the bottom of the wrapper up and over the filling, then continue to roll toward the opposite edge. 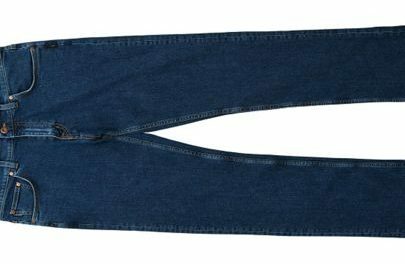 When you finish, the seam should be on the bottom. Once you’ve assembled all of the rolls, cover the baking sheet with plastic wrap and transfer to the freezer for at least 30-60 minutes (until they are firm) or up to 1 month. 350 and 375 F – adjust the heat under the pot as necessary. Use a spider strainer to transfer the pizza to the wire rack you prepared earlier to allow any excess oil to drain. Return the oil to 375 F before frying the next batch of rolls. Continue until they’ve all been fried. The rolls will be very hot when they come out of the oil so let them cool for a few minutes before serving. Pizza in the morning, Pizza in the evenin’, Pizza at suppertime! 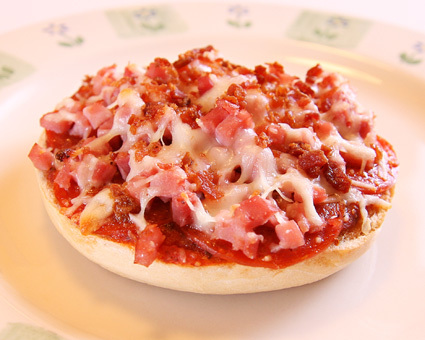 When pizza’s on a bagel, You can eat pizza anytime! Preheat oven to 400. Place bagels face up on a baking sheet. 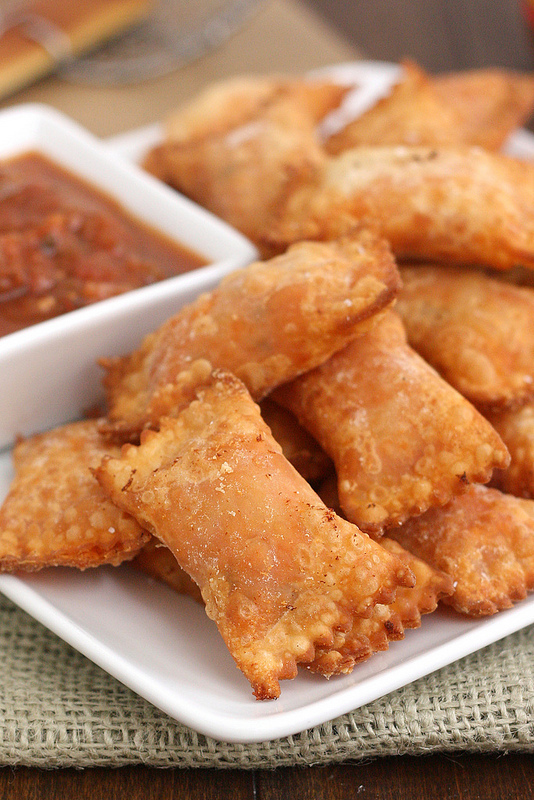 Spread with pizza sauce. Arrange five to seven slices of pepperoni on each, covering the bagel hole with one slice. Adjust oven rack to upper position and preheat oven to 425°F. Heat butter and 3 tablespoons olive oil in a medium saucepan over medium-low heat until butter is melted. Add garlic, pepper flakes, and oregano and cook, stirring occasionally, until garlic is softened but not browned, about 2 minutes. Stir in half of parsley/basil and a big pinch of salt. Remove from heat. Place bread cut-side-up on a clean work surface. Using a rimmed baking sheet, press down on bread evenly until compressed to about 2/3rds of its original height. of bits of garlic and aromatics. Set aside. While sauce cooks, spread 1/4 of mozzarella evenly over surface of bread and transfer to oven. Cook until cheese is barely melted, about 8 minutes. Remove from oven and set aside until sauce is cooked. Spread sauce evenly over bread, then spread remaining mozzarella on top of sauce. Transfer to oven and bake until cheese is melted and just starting to brown, about 10 minutes. Remove from oven and immediately sprinkle with Parmigiano-reggiano, remaining parsley/basil, and remaining tablespoon extra-virgin olive oil. 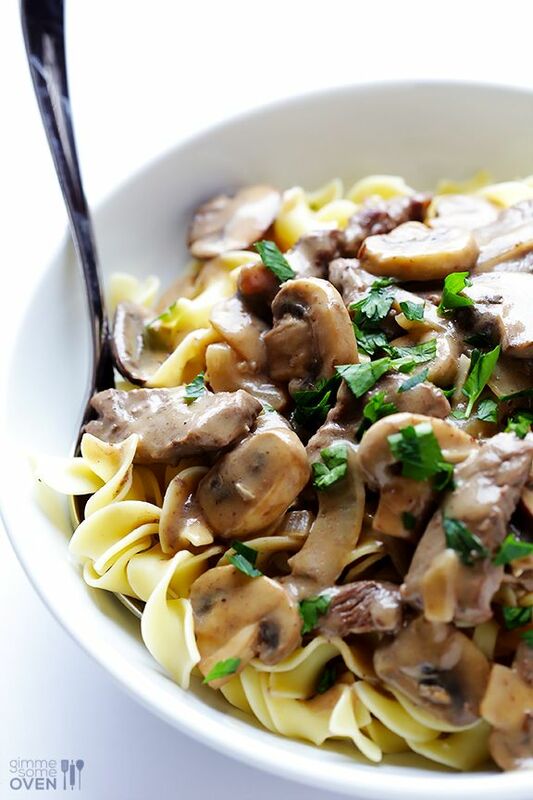 Many families in the 80’s used Campbell’s Cream of Mushroom soup for their Beef Stroganoff. or some made Hamburger Helper. 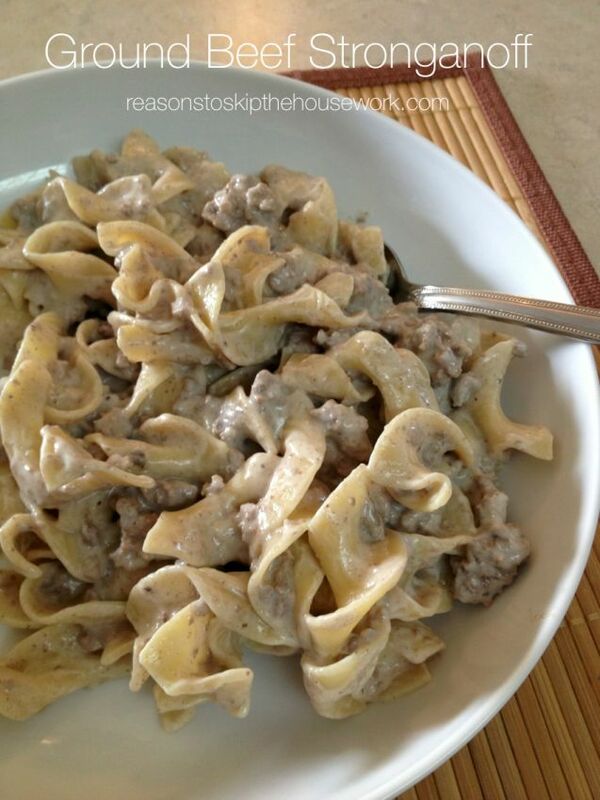 You can use ground beef or meatballs in your stroganoff. Return meat to skillet and add all other ingredients,except noodles. 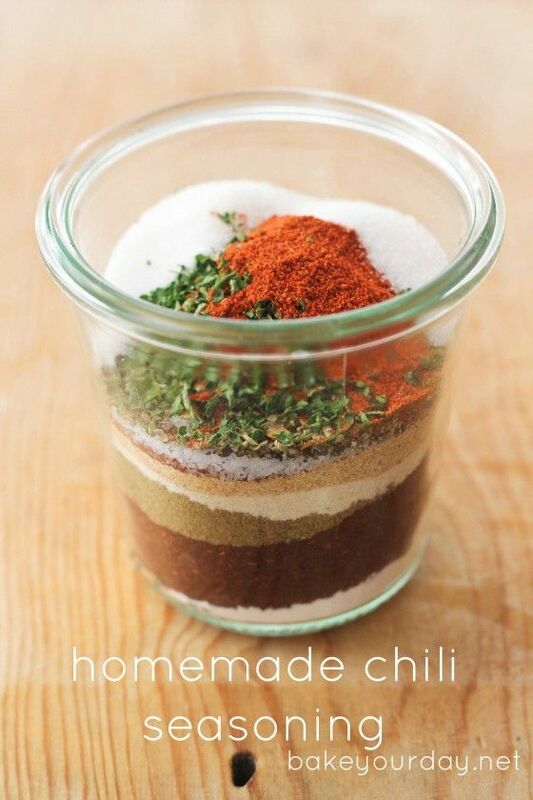 Blend together well and heat thoroughly on med-low. Boil noodles while preparing meat mixture. Meanwhile, as your pasta water is coming to a boil, melt the butter in a large saute pan** over medium-high heat. Add the steak in a single layer, seasoned with a few generous pinches of salt and pepper, and let it cook undisturbed for about 3 minutes to get a good sear. Flip the steak, and cook on the other side until browned, about another 3 minutes. Then remove steak from pan with a slotted spoon, and transfer to a separate plate. Set aside. Return pan to heat and add the remaining 2 Tbsp. butter. Once it has melted, add the onions and saute for about 3 minutes. Add garlic and mushrooms, and stir to combine. Continue sauteing for an additional 5-7 minutes, or until the mushrooms are cooked and the onions are soft. Add the white wine, and deglaze the pan by using your cooking spoon to scrape the brown bits off the bottom of the pan. Let the mixture cook down for an additional 3 minutes. 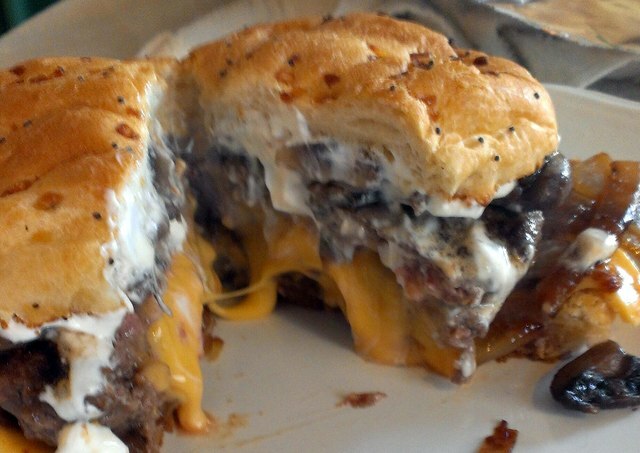 Pick up sandwiched Patties and pinch around edges to seal tightly, to ensure no cheese oozes out during cooking. Preheat grill or grill pan to medium heat. Cook Patties 6-7 mins per side flipping only once. While burgers are grilling, butter buns and lightly toast. Let burgers rest for 5 to 10 mins after cooking !!! “Pick me up” dessert which typically has coffee (some have alcohol, too) as an ingredient. I love it. There are a lot of variations. 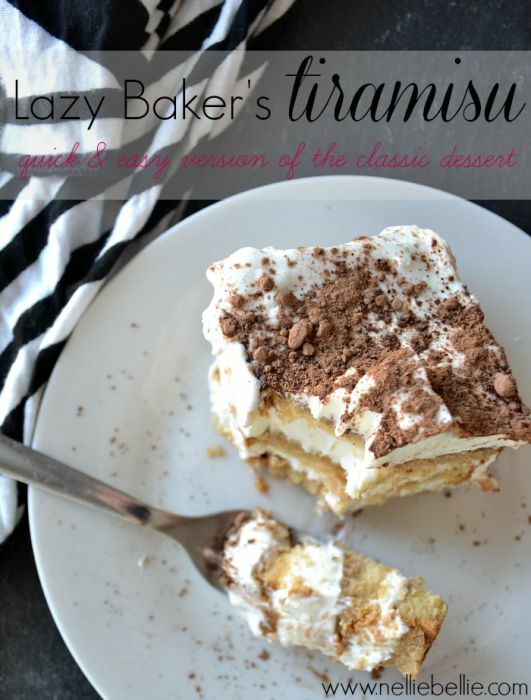 Here’s a recipe for classic Tiramisu, but very easy to make because it’s a slab. 1. Slice the pound cake. 2. Beat the cream cheese, whipping cream, and powdered sugar together until light and creamy. 3. Mix the coffee and alcohol together. 4. On the bottom of a 9 by 9 pan (or a trifle dish) place a single layer of pound cake, trimming to fit. 5. Pour 1/3 of the coffee mixture slowly over the top. 6. Spread 1/3 of the cream mixture on top. 7. If desired, put shaved chocolate on top of the cream mixture. 8. Repeat until ingredients are gone. 9. Sprinkle the top with cocoa. Place the chopped chocolate in a small bowl. Pour one cup of heavy cream into a small saucepan, and place the pan over medium heat. Bring the cream to a simmer, heating it until bubbles appear along the sides of the pan, but it is not yet boiling. Pour the hot cream over the chopped chocolate and allow it to sit and soften for a minute. 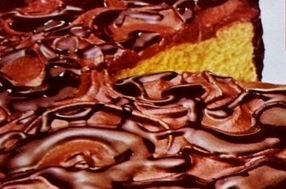 After a minute, whisk the cream and chocolate together until the chocolate is smooth, shiny and melted. Press a layer of cling wrap over the top and refrigerate the chocolate briefly until it thickens to the consistency of soft peanut butter. While the chocolate is chilling, prepare the mascarpone mixture. Place the egg yolks and sugar in the large bowl of a stand mixer fitted with a whisk attachment. Beat the yolks and sugar together on medium-high speed until they are very thick and pale, about 2-3 minutes. When you stop the mixer and lift up the whisk, the yolks should slowly drip from the whisk in a thick ribbon. Add the mascarpone cheese, salt, and vanilla extract, and beat on medium-low until the cheese is incorporated and the mixture is free of lumps. Don’t overbeat, or beat too quickly, since mascarpone is prone to breaking if it’s overworked! Transfer the mascarpone cheese to another bowl, and in the same mixing bowl—no need to clean it—place the remaining ¾ cup heavy cream. 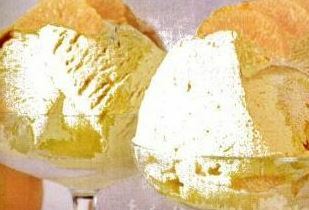 Whip the cream to firm peaks, then gently fold it into the cheese in several batches. To assemble the tiramisus, spread a thin layer of chocolate on the bottom of six 10-oz dishes or cups. Working one at a time, dip a ladyfinger quickly in the hot chocolate so that it is submerged, then place it in the serving dish. You may need to break the cookies into several pieces to make them fit into an even layer in the dishes. Repeat until all of the dishes have a first layer of soaked lady fingers. Spoon a thick layer of the mascarpone cream over the ladyfingers—you may find that it’s easier to put the cream into a pastry bag with a round tip, or a plastic bag with the corner snipped off. 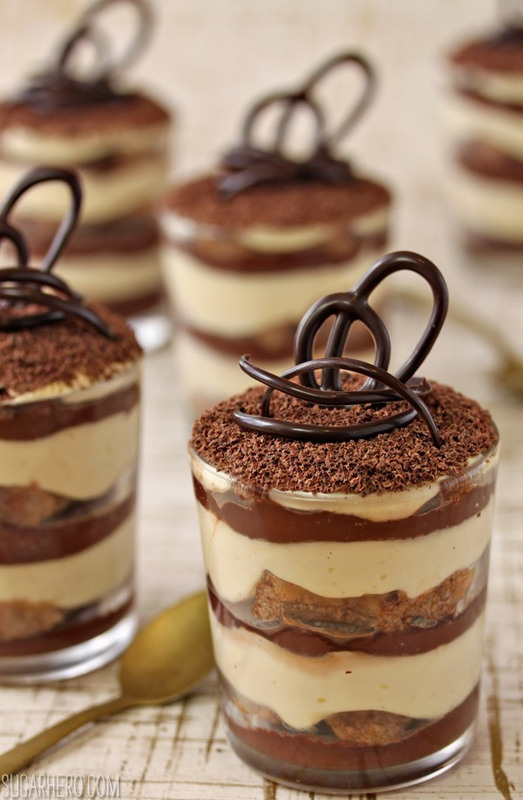 Once all of the tiramisus have a layer of mascarpone, spoon a thin layer of chocolate on top. Repeat the layers, adding more ladyfingers, mascarpone, and chocolate, until you reach the top of your container. Make sure that you end with a layer of mascarpone cheese. Finish the tiramisus with a topping of shaved chocolate, unsweetened cocoa powder, or a big rosette of whipped cream. 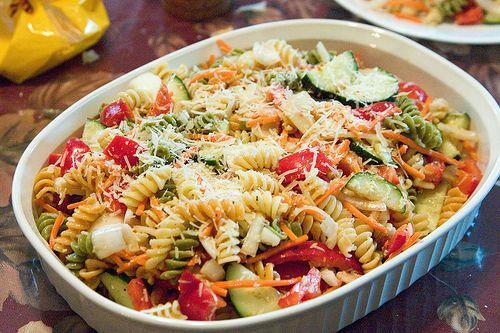 Refrigerate for at least 2 hours, and serve! Tiramisu keeps very well, and this dessert can be made up to five days ahead of time and kept, well-wrapped, in the refrigerator until ready to serve. 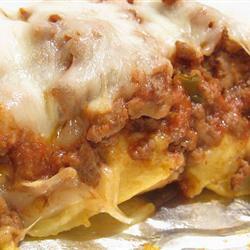 This recipe can also be made in a 9×13 pan. You will need more lady fingers to make it in a large rectangular pan, but the exact number will depend on the size of the brand you use. To make it in a 9×13 pan, start with a thin chocolate layer, then add dipped ladyfingers, mascarpone, chocolate, lady fingers, and mascarpone, in that order. 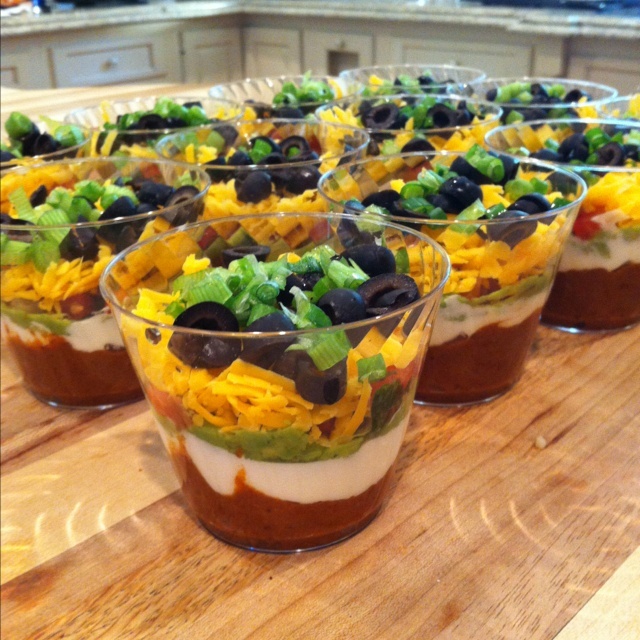 Top with shredded chocolate or cocoa powder, refrigerate for at least 2 hours, and then serve! 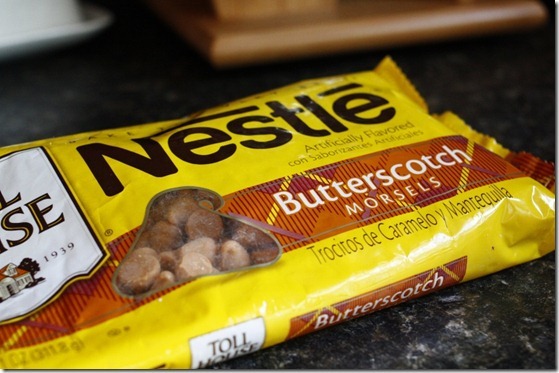 I used the oatmeal scotchies recipe on the back of the Butterscotch chips bag when I was a kid. I love Blondies, too. What’s not to love about Mud Pie. Some are frozen. There are many variations with some people calling them silk pies. As a kid, I just used pudding, cool whip and a pre-made crust. 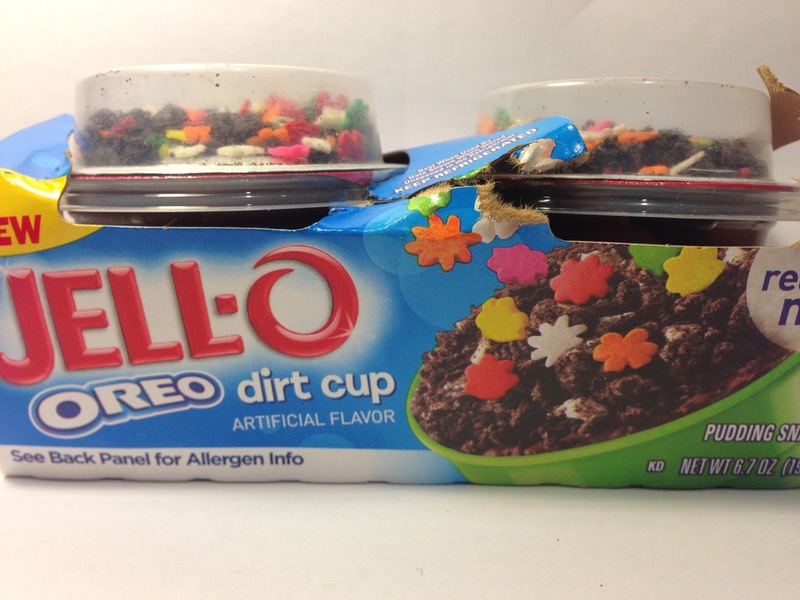 If you’re thinking it is just like the dirt cups, you’re right. bottom and up the sides of a 9-inch pie plate. 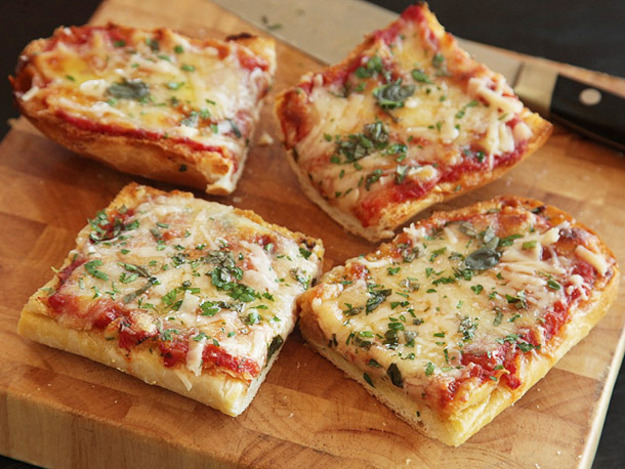 Freeze crust 30 minutes. and whisk well, until the yolks are pale and smooth, about 2 minutes. Set aside. the mixture back into the saucepan and place it over low heat. then remove from heat. Whisk in the chocolate until fully combined, then pour filling into chilled pie shell. Press plastic wrap over the top, and chill for 8 hours to set. 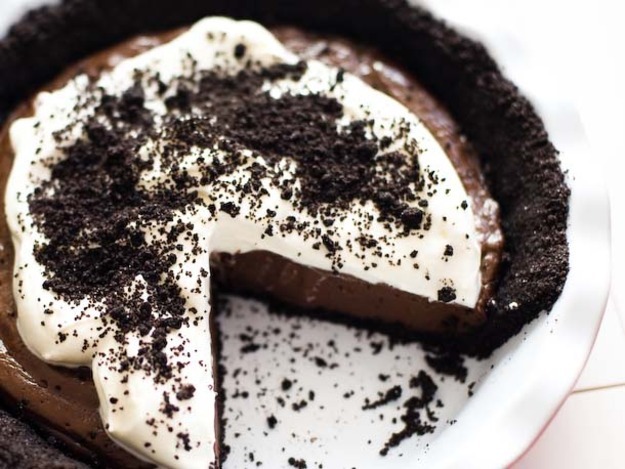 Try this Mississippi Mud Pie recipe. Our family used cubed stew beef. Sometimes the meat was marinated in Italian Dressing. Sometimes we made them using chicken or shrimp. It was pretty basic, we used metal skewers and added tomatoes, onions, potatoes, zucchini, bell peppers and mushrooms. I loved them and looked forward to whenever my mom made them. Kabobs are so popular now that there are tons of fruit, candy and dessert kabobs recipes. Basically, these days anything on a stick is popular. It’s like stick is the new toothpick. 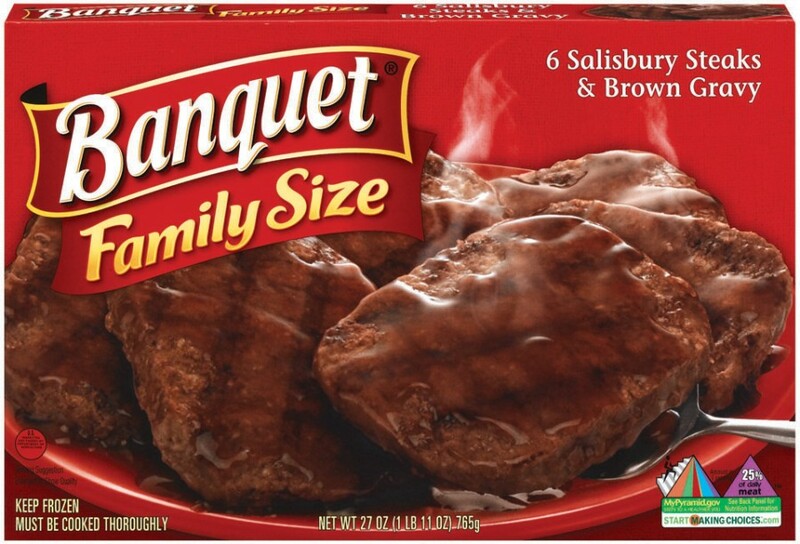 Cut the steak into 16 equal pieces if using a thin cut and 8 equal pieces if using a thick cut. Season with ½ teaspoon salt and ½ teaspoon pepper. Place the steak and mushrooms in a large bowl. Add the olive oil, vinegar, rosemary, and garlic, and stir until the steak and mushrooms are well coated. Cover with plastic wrap and refrigerate at least 30 minutes to 2 hours. Place the potatoes in a large saucepan and add enough water to cover by 1 inch. Bring the water to a boil and cook potatoes until just barely fork-tender, about 5-7 minutes. Drain and set aside. Heat a grill to medium-high and lightly oil the grate. Add the kabobs and grill about 5-6 minutes on both sides, flipping every 3 minutes. Sprinkle kabobs with remaining 1 teaspoon of salt and serve immediately. – If using wood skewers, soak them in warm water for at least 30 minutes before using so they don’t burn on the grill. 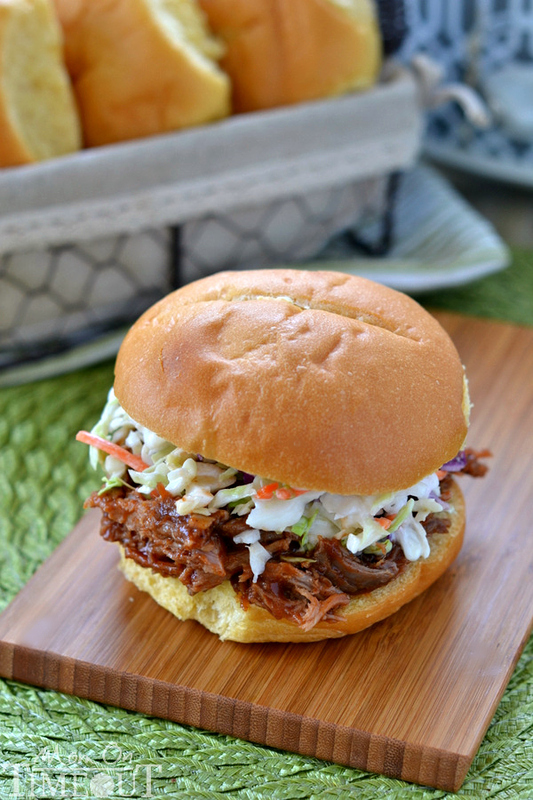 Pulled pork is still one of my favorite summer foods. I loved pulled pork sandwiches, but the meat is delicious in tacos, in salad, on pizza, baked potatoes and sweet potatoes, nachos and in mac and cheese, too. Or make shepherd’s pie. Some people like pulled pork sandwiches plain or with cheese. I loved it with cole slaw! Here’s a recipe for Sweet Pork and one for Chipotle Pulled Pork. I loved shake and bake. 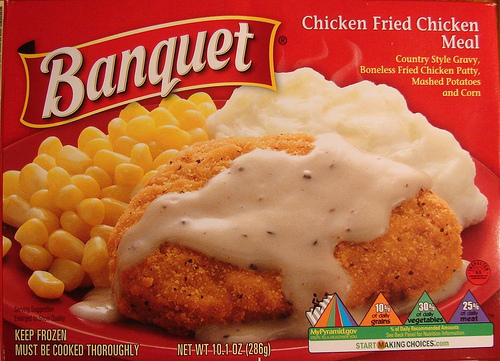 Mostly loved it on pork chops, but sometimes we had it on chicken, too. My mom would only make it if I begged, but I did love it and I’d ask my grandmother to make it when I stayed at her house, too. Drizzle oil over mixture then mix thoroughly until oil is well distributed and particles are fine. Growing up, I had a lot of stir fry. It’s still one of my favorite foods. I’m partial to using beef, but chicken is delicious, too. I’m not a seafood fan, but wow does the shrimp dish look good. In another bowl combine the chicken stock, soy sauce, teriyaki sauce and sesame oil together, stir in the cornstarch, mixing until smooth. 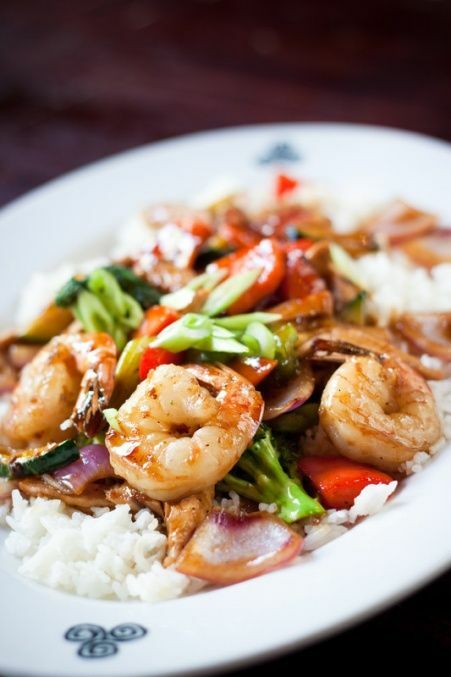 In a large skilled heat 1 tablespoon vegetable oil over medium high heat Add the shrimp and stir-fry until they’re cooked through, about 1 minute, Remove the shrimp from the skillet. Stir the cornstarch mixture and then pour over the vegetables in the skillet. Cook and stir until the mixture boils and thickens. Return the shrimp to the skillet heat 1 minute. Here’s a honey teriyaki sauce and another teriyaki sauce recipe. Very popular dressing when I was a kid. I loved it. But I haven’t made or bought this type of dressing in years. This makes a large container of dressing. Store extra in the fridge-will keep for several weeks. Place all ingredients except for the poppyseeds in a blender. Place all ingredients except for the poppyseeds in a blender and blend until smooth. 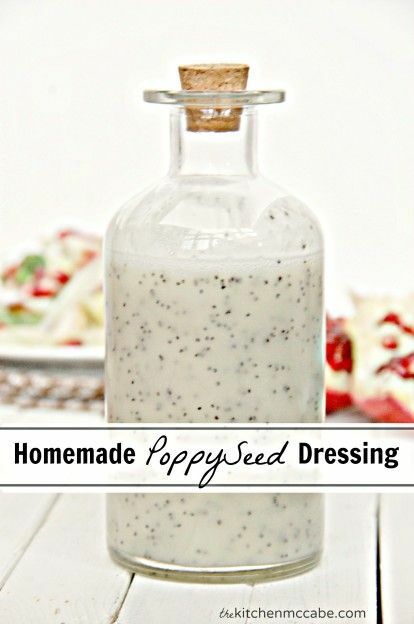 Add poppyseeds to blended dressing. Pour in a air-tight jar or seal-able container and shake it up. Keep refrigerated. Let sit at room temperature for 5 minutes before using. This will allow the coconut oil to become less solid. Shake and pour. Dressing will keep for up to two weeks. My mom used Good Seasons Italian Dressing Mix for years. I LOVED it. I loved the little decanter. I loved mixing it. I was an Italian Dressing girl. The problem is as soon as I discovered Ranch Dressing, I never looked back. Now I mostly use it for pasta salad and the occasional recipe requires it. I still love it, but love other dressings more. 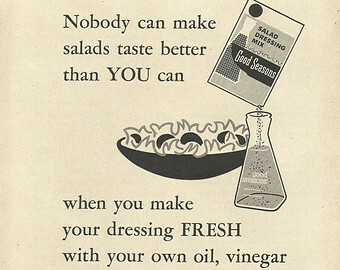 I remember dressings that started to become more popular such as Bleu Cheese, Caesar, Thousand Island, Ranch, etc. etc. But whenever I have Italian Dressing, I remember being quite young and I always picture my mom and I in the kitchen together making salad. 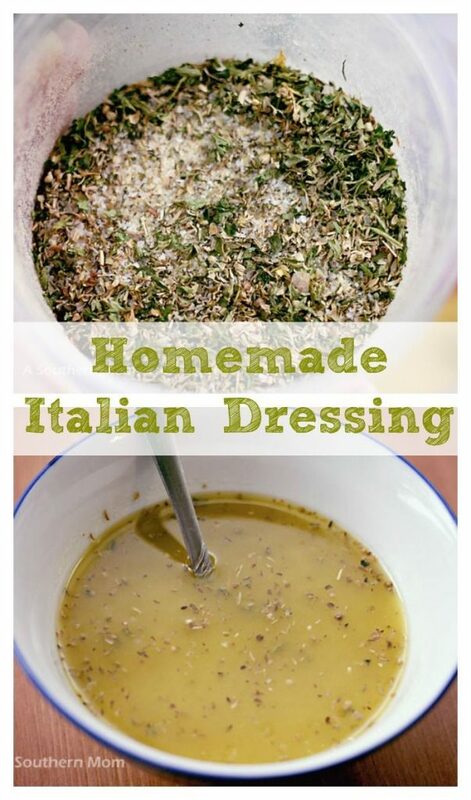 To make the dressing, pour 1/4 cup white vinegar, 2/3 cup olive oil and 2 tablespoons of water together in a container. My mom made stuffed peppers often. I wasn’t a huge fan of it, but I didn’t hate it either. I think it was just too much bell pepper to rice mixture for me as a kid. 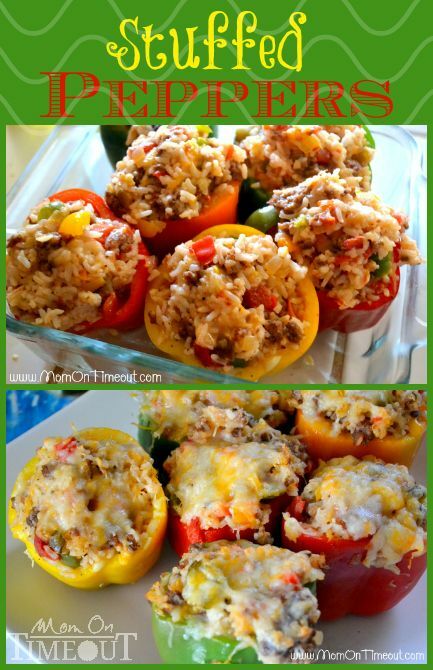 Try Quinoa Stuffed Peppers. Or Jalapeno Poppers. Everywhere get-together had clams casino. They’re delicious and I’m not a fan of clams. Soak the clams in cold water for about 30 minutes. Discard any that don’t close when gently tapped. Put the clams in a pot and boil for about 5 minutes or until they are all opened. Discard any that don’t open. Let them cool slightly. 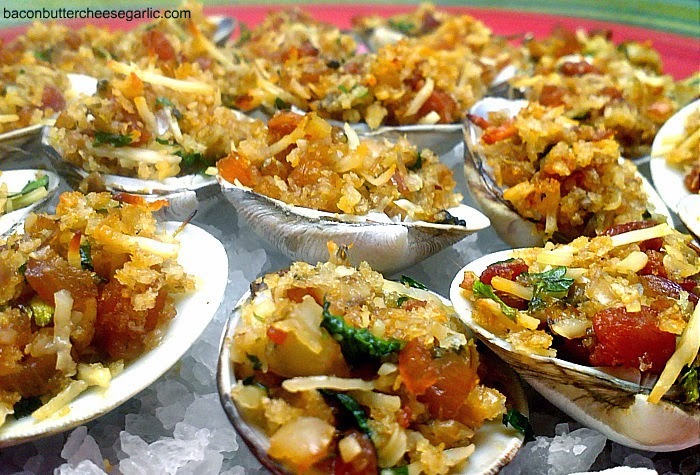 Try Baked Hot Clam Dip or Linguine with Clams Casino or how about Clams Casino Pizza? 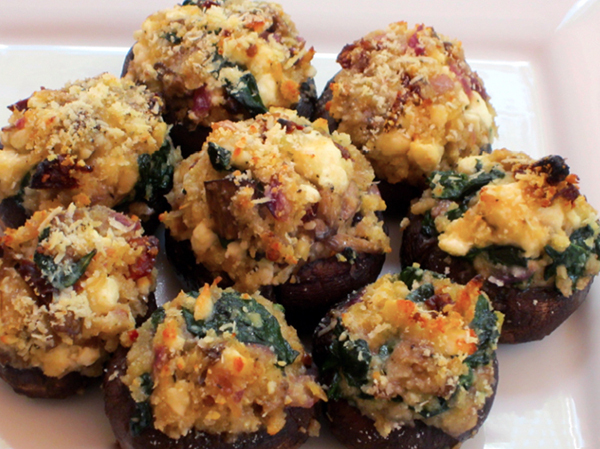 If you want, you can use clams casino stuffing for mushrooms. I’m pretty picky about my stuffed mushrooms. I love them so much and some people make them just wrong. You know what I’m saying. Some are just soggy and gross. I am not a fan of the kind with cream cheese. Just saying. But there are tons of good recipes out there. I miss when everyone was making stuffed mushrooms. Since marriage, I have to say Life is too short to stuff a mushroom. Ha! Here’s hoping you have the time. In a medium skillet, add oil and heat to medium-low, saute onion, mushroom stems and sun-dried tomatoes until tender, about 4 minutes. Add minced garlic and continue to saute one additional minute. Add spinach and saute just until wilted. Remove from heat and add the remaining ingredients but only 3 tablespoons of parmesan, stir to combine. Stuff mushrooms with mixture, place on a cookie sheet, sprinkle with remaining tablespoon parmesan, and heat until cheese is melted, about 15 minutes. *Mushrooms are very hot coming out of the oven so be sure to cool a few minutes before serving. This appetizer is yummy warm or cold. I ate a lot of pasta in the 80’s. While I’m more of an Alfredo fan, everyone seemed to be eating pasta primavera and pasta carbonara. In a large pot, saute onion, garlic, zucchini, asparagus, red pepper, yellow pepper and carrots in butter over medium heat until veggies start to soften, 5-7 minutes. Sprinkle with flour and cook 1 minute. Stir in chicken stock and let mixture turn into a thick sauce. Add in spices, seasonings and cream. Stir to incorporate and reduce heat to low to keep warm. 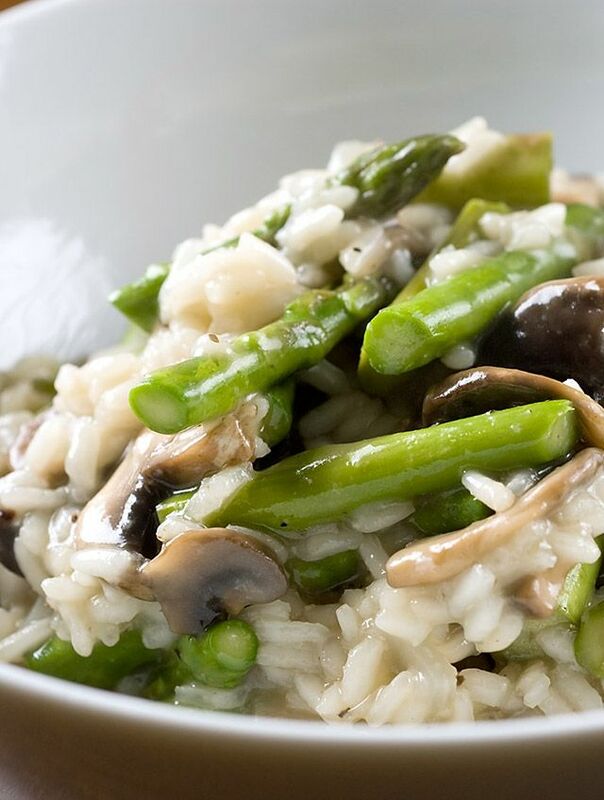 Love risotto and don’t make it often enough. I love how it’s rich and creamy. I’m very particular about my risotto. I don’t like when its overcooked at all. It HAS to be al dente and there can’t be too much liquid. liquid is absorbed by the rice. I’ve had this with all types of pasta (elbows, penne, rigatoni, tortellini, ravioli, etc) Love them all. Delicious with sausage or chicken. The sauce can be time-consuming. But it’s worth it. Meanwhile, drain the tomatoes through a sieve. (Save the strained juice. I stuck mine in the freezer. 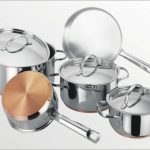 It can be used for future sauce-making days as well as for homemade bloody Mary mix, etc. Maybe you have more thoughts for repurposing this strained juice? Would love to hear.) Put on an apron and crush the tomatoes into the pan with your hands — careful hear…you might make a mess all over your oven. Add 2 teaspoons salt and a pinch of black pepper. Cover the pan with a tight fitting lid and place it in the oven for 1 1/2 hours. Meanwhile, bring a large pot of salted water to a boil and cook the pasta al dente. (Note: Ina adds 2 tablespoons of kosher salt to her pasta water. I did this, too, and found it really seasons the pasta nicely. There is no need to save pasta cooking liquid in this recipe, but if there were, I think the 2 tablespoons would be a little too much — the reserved liquid would be too salty. Just something to keep in mind.) Drain and set aside. Place the tomato mixture in a blender or food processor and purée in batches until the sauce is a smooth consistency. Place potholders or dishtowels around the handles of your pot to prevent burning your hands in the next step. (Note: I puréed a handful of basil with the sauce at this step and didn’t add anymore fresh herbs.) Return sauce to the pan. 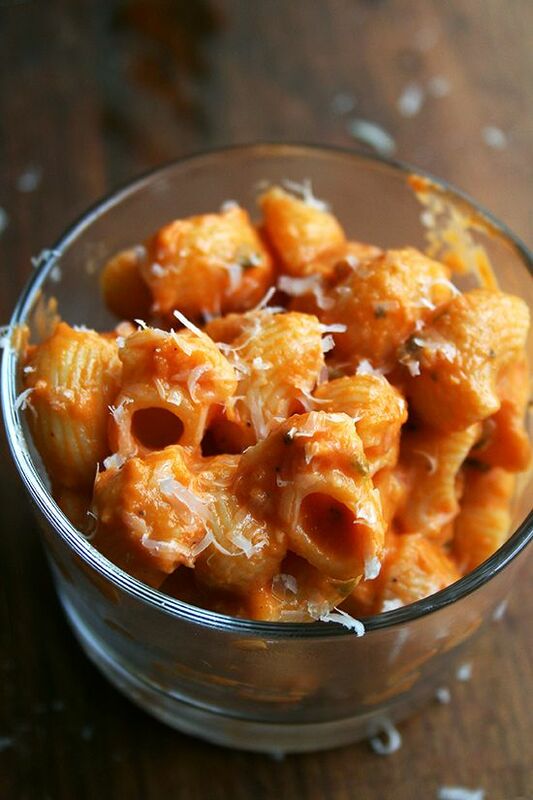 Try Pasta with Pancetta and Vodka Sauce. 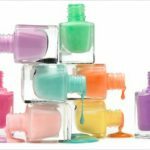 Placed in clear plastic or paper cups, small mason jars, small clay pots. 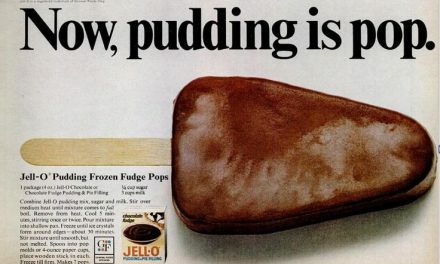 So popular that Jell-o created their own product. Makes 5-7 cups, depending on the cups you use. I used Bakerella’s red velvet cake recipe, but cut it in half and tweaked a few things. You’ll only need batter for one round 8 inch pan. Preheat the oven to 350 degrees. Spray an 8 inch round pan with non-stick spray and line with parchment paper. In a small-medium sized bowl, combine dry ingredients: flour, cocoa powder, baking soda, and sugar. Carefully whisk them together. 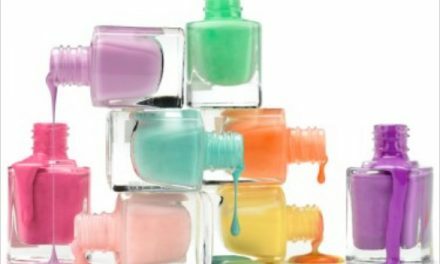 In another medium sized bowl or the bowl of a stand mixer, combine wet ingredients: egg, oil, vinegar, vanilla, and 1 tsp pink gel food coloring. Mix well. Measure out 1/2 cup buttermilk. Add the dry ingredients and the buttermilk to the wet ingredients. Mix well and until everything is completely incorporated. If your batter isn’t as pink as you want it at this point, add some more food coloring one teaspoon at a time until you reach the desired shade of pink. Pour batter into prepared cake pan and bake for 20-25 minutes. Remove the cake from the oven and insert a toothpick into the center of the cake. If it comes out clean, your cake is ready. If not, put the cake back in the oven for a couple of minutes. Let the cake sit for a few minutes, then transfer it to a wire rack to cool completely. Once the cake is cool, cut it into small squares or slices and transfer them to a bowl and cover with plastic wrap. 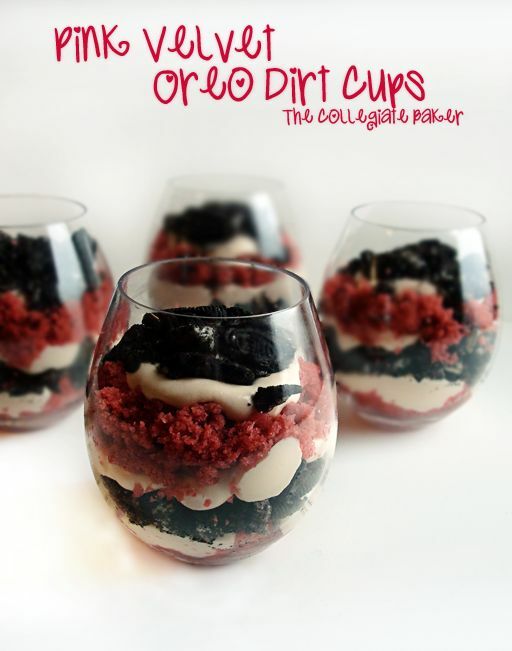 Adapted from my Oreo Dirt Cake. In one bowl, mix the instant vanilla pudding with 2 cups of milk. Whisk it until completely combined and let it sit in the fridge. In another bowl, or the bowl of a stand mixer, beat the butter and cream cheese until smooth and creamy. Add the powdered sugar and mix well. Scrape the sides of the bowl and mix again. Check the bowl of pudding in the fridge. It should be thicker now. Add it to the cream cheese/butter mixture and mix until combined. I wanted the pudding to be a light pink color, so I added a small amount of pink food coloring, about 1/2 teaspoon. If you want it to be pinker than that, you can always add more. Transfer the Oreos to a large Ziploc bag, and then put that bag in another Ziploc bag. There are several ways you can crush the Oreos from here. I used the end of a wooden spoon. I have also used a hammer and a sharpening steel thing from my mom’s knife set. If you have a food processor or a blender, you could do that as well. Basically, you want the Oreos to be in chuncks, not crumbs. So just keep that in mind. Depending on the size of the cups you use, this will make 5-7 cups. I ended up using 5, but afterward I decided that the servings were a little too big (which totally wasn’t a problem, by the way), so next time I might use slightly smaller cups. So if you want to start out with five cups just to be sure, and you still have some ingredients left over after that, you can make a couple more. Add some of the sliced cake pieces to the bottom of each cup. Then a layer of pudding. I transferred the pudding to a piping bag, cut off the tip, and piped the pudding into the cups. Add a layer of crushed Oreos. 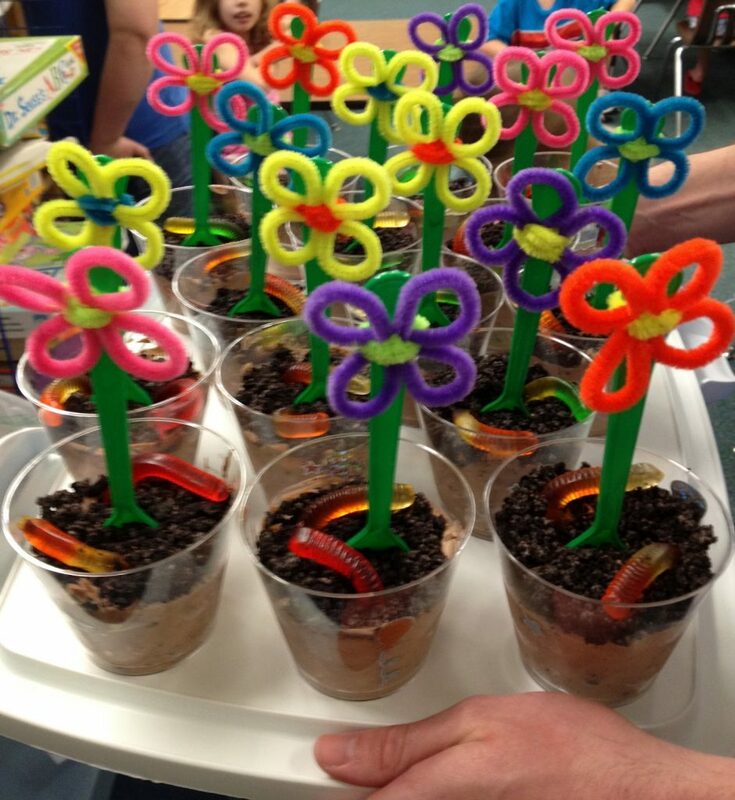 Much easier version: Just add crumbled Oreos and a Gummy Worm to Pudding cups. 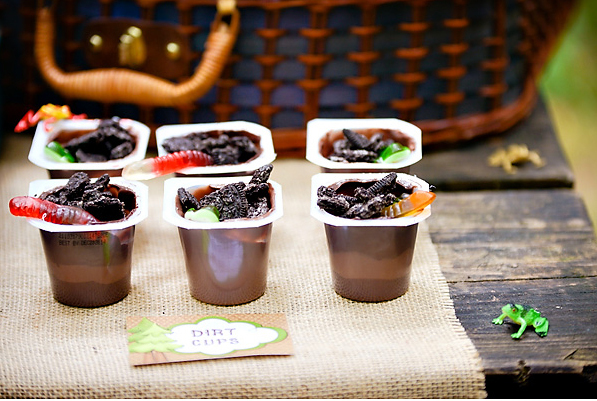 Here’s a Classic Dirt Cup Recipe. Many poke cakes incorporate either Jello gelatin or Jello pudding. 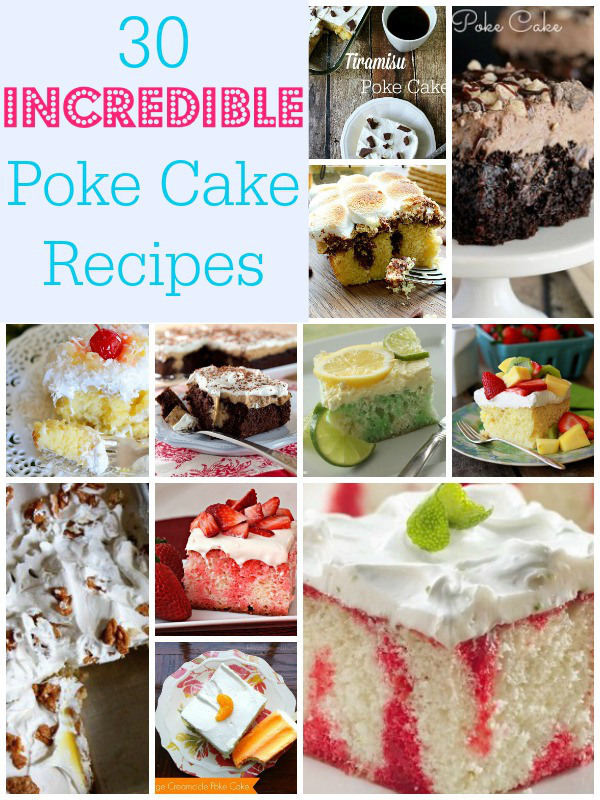 There are just so many poke cake recipes, I had a hard time picking only a couple. Note: the lemon curd can make this a bit tart– which I like. But if you are at all concerned about the cake being TOO “lemon-y,” ease up when pouring the lemon curd and don’t use the whole batch. 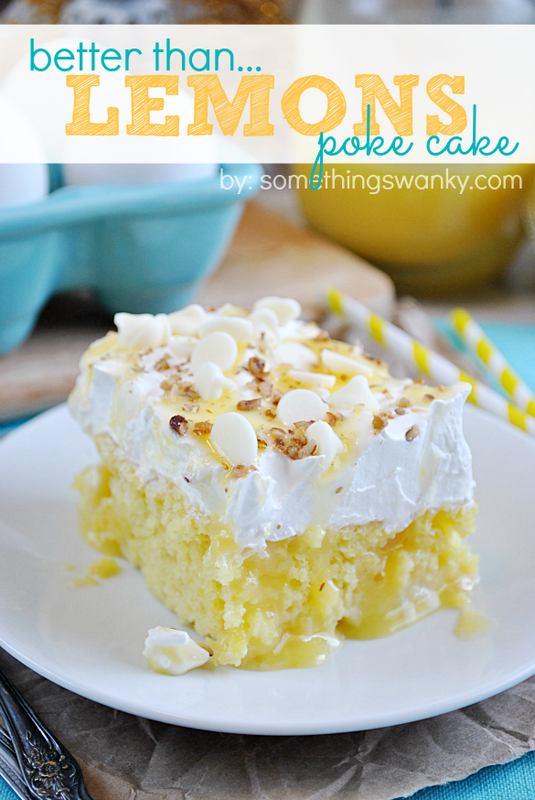 Poke Cake Recipes Compilation and Photo by Life with the Crust Cut Off. 2 Bonus ideas because I-Just-Can’t-Stop at 40. Definitely a favorite for many people. 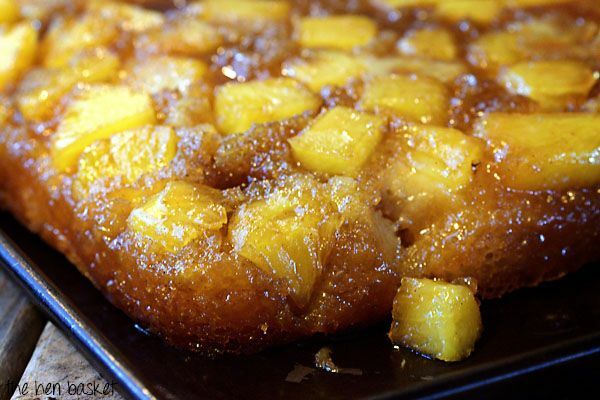 Here’s a Classic Pineapple Upside Down Cake. 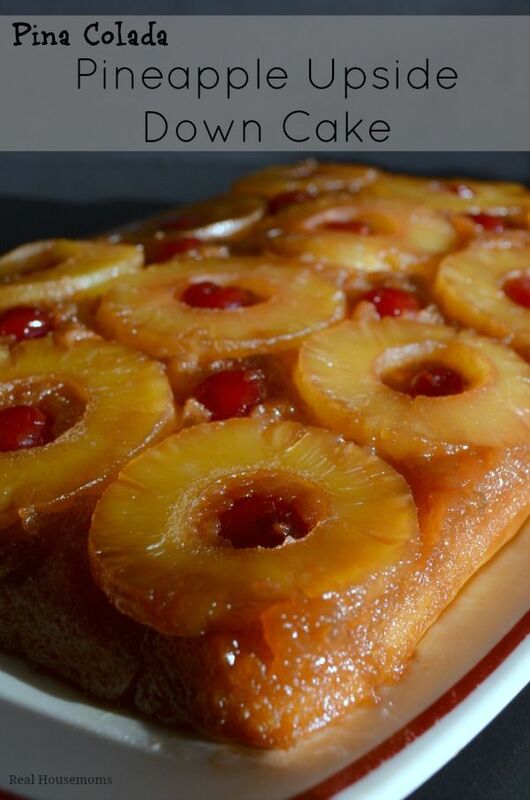 And one recipe for Pineapple Upside Down Cupcakes. And two more delicious alternatives. mixture. Place a cherry in the center of each pineapple slice and in the whole created where four pineapples meet. Over medium heat, combine your brown sugar, butter and salt. Cook until sugar has dissolved completely. Add milk and mix well. Continue to cook for 3 minutes. Stir often. In a medium bowl, beat remaining cake ingredients scraping down sides of bowl occasionally. Coat a 9×13 dish with non stick spray. Pour 1/2 of your caramel mixture in the bottom of your baking dish. Add your pineapple chunks. Pour cake batter over the top of pineapple. Bake 30 to 40 minutes or until toothpick inserted in center comes out clean. All ovens very, so begin checking around 25 minutes. Before inverting your cake, use the handle of a wooden spoon and poke holes through out your cake. Drizzle the remaining caramel sauce into the wholes. Place heatproof serving plate upside down over pan and then turn plate and pan over. Leave pan over cake a few minutes so brown sugar mixture can drizzle over cake; remove pan. When in doubt what to add to your 80’s party, pick up one of these bad boys. Nostalgia overload. 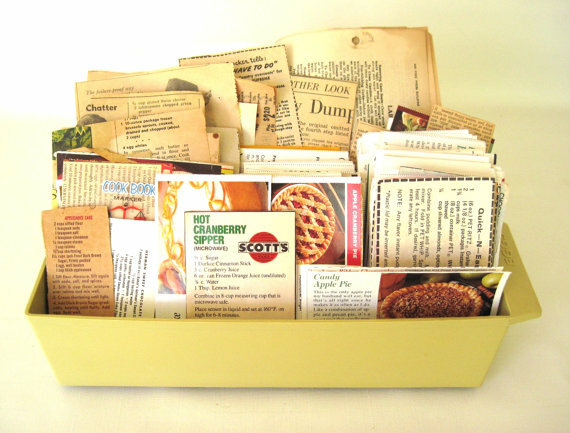 What 80’s recipes/foods do you remember? Great blog! I still but the Chef Boyardee pizza kits at walmart. My dad always made them in the 80’s and I make them on rare occasions and STILL love them! I wasn’t alive during the 80’s (I was born in 1993) but it’s my favorite decade currently and I am OBSESSED with it. I actually got a sno-cone maker for my 7th birthday in the year 2000! 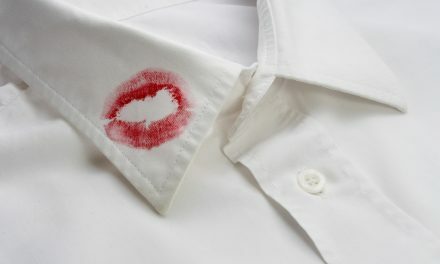 Just like the one in the picture. 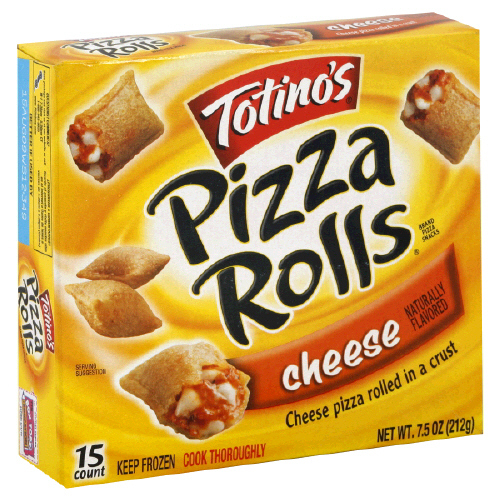 I remember eating a LOT of frozen pizza in the 90’s growing up…also roast dinners, and shake and bake chicken. I grew up in the Midwest and we have a very…unique taste in food to put it nicely lol. Thanks so much for all these great ideas. The youth group is having a 80’s night party so I need some food ideas to help them out with (since they weren’t born in the 80’s). I was trying to remember what we used to make then, this was so helpful! I was between 13 and 16 years old. One of the very few dinners I could prepare myself was a cold pasta salad, sold in a box. There was a white mesh bag with pasta in it. Boil then run under sink. Mix sauce (lots of mayo). PS born 1970. If I were a billionaire, I would find out what this product was and begin production immediately. 2nd would be Keebler tato skins. Thank you for listening ?